The War Memorial on the outside wall of the Memorial Stores, Limpsfield Village. B Company, 7th (Service) Battalion Queen’s (Royal West Surrey) Regiment. James Scovell Adams was born at Paddington in London on the 24th of September 1898 the son of James Scovell Adams, a stock broker, and Nora (ne Goddard) Adams of "Rockfield" in Limpsfield. He was christened at Holy Trinity Church Paddington on the 12th of November 1898. He was educated at Mostyn House School at Parkgate in Cheshire where he was a boarder. He enlisted as Private C/39933 in the Queen’s (Royal West Surrey) Regiment before being commissioned as a 2nd Lieutenant in the same regiment on the 1st of August 1917. He embarked for France in September 1917. The 8th of August 1918 was the opening day of the Amiens offensive which finally broke the stalemate on the Western Front after four years. The 7th Battalion Queen’s (Royal West Surrey) Regiment was detailed to capture the ground to the north of the Bray-Corbie Road and to protect the flank of Fourth Army. They were due to be supported by six tanks which failed to make the rendezvous at the appointed time. By 3.40am the battalion was in position with one wave in front and three behind Burke Trench. Almost at once a heavy barrage of enemy artillery fell upon them causing several casualties. Once the attack had begun position regarding the progress of the assault was unclear and runners were sent forward to report but most became casualties themselves. At 7am Lieutenant Colonel C. Bushell VC, DSO, officer commanding the battalion, went forward himself with his runner and collected all available men who he led forward from Croydon Trench and assaulted the enemy lines, capturing Cloncurry trench before being mortally wounded by a sniper. 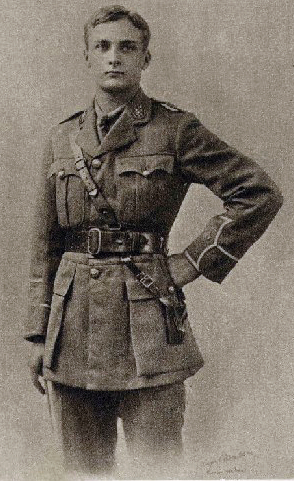 Colonel Ransome of the Buffs was placed in command and discovered that Cloncurry trench was held by about 100 men of “D” Company who he promptly reinforced with “C” Company under Captain Simmonds. He decided that the objectives could still be taken and he ordered Captain Snell to affect this. Snell urged the men in Cloncurry Trench to follow him and led them down the trench. Despite enemy resistance the trench was eventually cleared and consolidated, the Queens being relieved at 5pm when a Brigade of 12th Division passed through them to capture the ridge and continue the advance. Casualties for the attack were 4 officers and 24 other ranks killed 6 officers and 140 other ranks wounded with 68 men gassed and 7 suffering from shell shock a total of 275 all ranks. James Adams was listed amongst the wounded but died later that day. He is commemorated on the war memorial at Mostyn House School. He is buried at Pernois British Cemetery, Halloy-Les-Pernois Section III Row E Grave 3. Died of wounds on the 23rd of October 1915, aged 21. Harold Ashton was born in Limpsfield on the 31st of October 1893 the son of Albert Ashton, a bricklayer’s labourer, and Alice Ashton. He was educated at the National School, Limpsfield. He emigrated to Canada and enlisted into the army at Kingston, Ontario on the 23rd of November 1914, giving his occupation as a labourer. According to his attestation papers he was 6ft and ¼ inch tall with light brown hair and was in good health. On the 21st of October 1915 the 21st Battalion came out of the line having been relieved by the 20th Battalion and proceeded to Brigade reserve at “Ridge Wood”. Whilst in reserve the battalion was expected to furnish working parties. On the 23rd of October such a working party, consisting of 490 men, was furnished for the cutting of new trenches. Enemy shelling became heavy during the evening and the battalion war diary describes the working party as being “surprised” and it is assumed that this was by a German raiding party. During the exchange of fire two men were killed and two wounded one of whom died later. 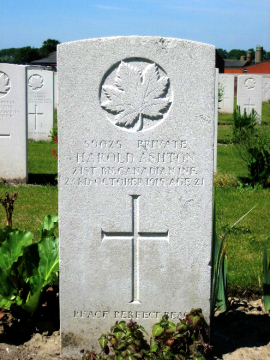 Henry Ashton was hit in the back by shrapnel and died later the same day. He is buried in Ridge Wood Military Cemetery Plot I Row O Grave. 59 Training Squadron Royal Flying Corps. Killed on active service on the 3rd of August 1917 Age 23. Clive Maxwell Bailey was born at Wimbledon in January 1894 the elder son of Reginald Bailey, a solicitor, and Grace (née Grierson) Bailey of Barton Hatch Cottage, Limpsfield. He was educated at Uppingham School from January 1909 where he was in West Deyne House until 1913. He went on to Gonville and Caius College Cambridge where he was an undergraduate when war broke out. On the outbreak of war he enlisted at Epsom as Private PS/33 in the 19th (Service) Battalion Royal Fusiliers (2nd Public Schools). He embarked for France on the 14th of November 1915 where he was a bombing specialist before returning to the UK to undergo officer training. He was commissioned as a 2nd Lieutenant in the Royal Flying Corps on the 5th of August 1916 and was promoted to Flying Officer on the 20th of March 1917. He was posted to 59 Training Squadron and was killed in a training accident while flying B.E.2e, registration No.4434 at Yatesbury Colne in Wiltshire. He is buried at St Peter’s Church, Limpsfield. Killed in action 9th of August 1915. Frederick George Baker was born at Wandsworth in South London in 1894 the eldest son of Clifford George Baker, a domestic gardener and former postman, and Sarah (née Johnson) Baker, later of 3 Hurst Cottages, Station Road, Limpsfield. He was christened at St Luke’s Church, Kingston on the 16th of September 1894. He was educated at the National School, Limpsfield and worked as a grocer before enlisting into the army at Croydon. He landed at Gallipoli with his battalion on the 17th of July 1915. For details of his death see also Private Webster. He is commemorated on the Helles Memorial Panels 30 and 31. Killed in action on the 3rd of October 1918 aged 21. William Frampton Baker was born at Wandsworth in South London on the 21st of July 1897 the son of Clifford George Baker, a domestic gardener and former postman, and Sarah (née Johnson) Baker of 3 Hurst Cottages, Station Road, Limpsfield. He was christened at St Anne’s Church Wandsworth on the 29th of August 1897. He was educated at the National School, Limpsfield. He enlisted in the Royal Navy at Chatham. On the morning of the 3rd of October 1918 HMS Submarine L10, under the command of Lieutenant Commander Alfred Ernest Whitehouse RN, was to the north of Terschelling in the North Sea where it was stalking a German convoy which had been attacked by British destroyers the previous evening. That afternoon, a number of German naval vessels were in the area searching for survivors and L10 signalled that she was going to attack the German Squadron which consisted of the German destroyers S34 and S34 as well as two motor torpedo boats which were on route to Germany from Zeebrugge. The S34 hit a mine before the L10 had a chance to attack and the S33 pulled alongside to rescue survivors. L10 used the opportunity to attack S33 with torpedoes and she was badly damaged. Initially the crew of S33 thought that they too may have hit a mine but they then saw L10’s conning tower come clear of the water and subjected the submarine to accurate and persistent shelling until she sank with the loss of the entire crew of 39 of which William Baker was one. 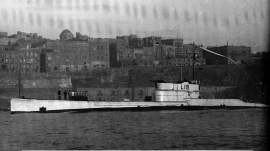 The L10 was the only “L” class submarine to be lost during the war; the wreck has never been located. The S33 subsequently sank. He is commemorated on Chatham Naval Memorial Panel 28. B Company, 31st Battalion Canadian Infantry (Alberta Regiment). William Baldwin was born on the 25th of August 1889, the son of Henry Baldwin, a gardener, and Esther Baldwin of Crockham Hill in Kent. He was the husband of Maude C. Baldwin of Maidstone in Kent. He enlisted as a Private in the 184th Battalion Canadian Infantry at Winnipeg on the 29th of February 1916 giving his address as 851 Madison Street, St James where he lived with his wife. He was employed as a teamster and stood 5ft 10ins in height with brown hair and grey eyes. On the 3rd of May 1917 the 31st Battalion Canadian Infantry (Alberta Regiment) was at Bois Bernard and were detailed to attack an enemy held position known as New German Trench with A and D Companies in the vanguard and with B Company in support. As the troops assembled for the attack they came under artillery and machine gun fire which delayed their attack when combined with the difficulties of forming up in the dark. By the time they went over the top the supporting British barrage had passed over the German front line trench and the Germans quickly manned it. By the time the Canadians got to the German line, a distance of some 600 yards, they were under fire from both flanks and found the concertina barbed wire in front of New Trench largely uncut, although some men did manage to get into the German trench. These men were soon forced out and pushed back into no man’s land where they took cover in shell holes. During the late afternoon two parties under Lt G.S. Robertson and Lt A.E. Metcalfe succeeded in re-entering New German Trench, each with a party of bombers. They managed to capture a machine gun along with 9 prisoners and to consolidate the German position. A German counter attack later in the day was driven off by rifle fire. Casualties for the 31st Battalion were 4 officers and 27 other ranks killed with 7 officers and 104 other ranks wounded and 57 other ranks posted as missing. William Baldwin was among the missing. He is commemorated on the Vimy Memorial. Probably Alfred John Brown Private 60270 101st Labour Company Labour Corps, who was born at Heathfield in Sussex, enlisted in Oxted as Private 26658 in the 34th Labour Battalion Royal Fusiliers and lived at Edenbridge. He died of wounds on the 10th of June 1917. He is buried at Mendinghem Military Cemetery Plot II Row D Grave 32. Killed in action 11th October 1917 aged 20. Charles Arthur Brown was born at Limpsfield the eldest son of Charles Brown, a coachman, and Agnes Brown of The Stables, Tenchleys, Limpsfield. He was educated at the National School, Limpsfield. He enlisted at Guildford. On the 4th of October 1917 the 7th Battalion Queen’s (Royal West Surrey) Regiment was at St.Jan-ter-Biezen when they heard of the success of the latest in a series of battles, collectively known as the Third Battle of Ypres. This was the Battle of Poelcapplle; part of the Passchendaele ridge where 4,446 enemy prisoners had been captured along with 6 guns and all objectives had been taken. On the 9th of October they moved to “Dirty Bucket” Camp where, the next day, they received orders to move forward following the “failure of 32nd Brigade”. They were ordered to relieve that Brigade and “carry out the assault allotted to it”. 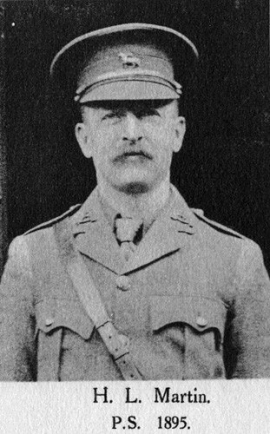 The Division was under General Maxse, who at a briefing of his officers, said “I have arranged a very nice battle for you, gentlemen, with lots of Huns to kill”. The conditions in the front line were appalling; it had rained all day on the 11th and to get through the mud was almost impossible, many men becoming stuck fast and being unable to reach the assembly area. The attack went in on the 12th and perhaps, unsurprisingly failed, with heavy casualties to the Brigade as a whole. Private Brown had been killed before the attack even began, most likely being a victim of the relentless shellfire or simply drowned in the sea of mud that was Passchendaele; his body was never recovered. He was one of 137 casualties, of all ranks suffered by the battalion in a three day period. He is commemorated on the Tyne Cot Memorial Panels 14 and 17 and 162 to 162A. Died of wounds on the 20th of July 1916, aged 39. John Beard was born in Limpsfield in 1877 the son of George Beard and Eliza Beard of 7 Lodge Lane, Westerham. He was educated at Hosey School, Westerham and was a member of the local volunteer battalion. On leaving school he worked as a drayman at the Westerham Brewery. He enlisted at Maidstone as a Private in the Queen’s Own (Royal West Kent) in February 1915 and after training he was posted to the 1st Battalion of his regiment. He embarked for France on the 1st of May 1915. The battalion arrived on the Somme front on the 14th of July; some two weeks after the offensive had begun on July the 1st 1916. They moved into the front line trenches between Bazentin-le Grand and Longueval on the night of the 19th of July during which time the Germans carried out a bombardment of the British lines. John Bead was wounded by shell fire and died of his wounds the following day. He is commemorated on the war memorial at Westerham. He is commemorated on the Thiepval Memorial Pier and Face 11C. 1st Battalion Sherwood Foresters (Nottinghamshire and Derbyshire) Regiment. Killed in action on the 26th of March 1918, aged 29. Owen Stanley Burchell was born at Itchingfield in Sussex on the 2nd of February 1889 the fifth son of George Burchell, an agricultural labourer, and Amelia Burchell later of 25 Godstone Road, Whyteleafe in Surrey. He worked as a bricklayer and later as a carman. He enlisted into the army at Woolwich as Driver 059763 in the Army Service Corps, Horse Transport on the 8th of February 1915. At his medical examination it was recorded that he was four and three quarter inches tall. He was married on the 14th of August 1915 at St Peter's Church, Limpsfield to Millie (née Glosby) of 5 Pains Hill, Limpsfield. He embarked for service in France on the 5th of May 1916 and landed there the following day. On the 15th of October 1917 he was compulsorily transferred as Private 72688 to the 1st Battalion Sherwood Foresters (Nottinghamshire and Derbyshire) Regiment. He is commemorated on the Pozieres Memorial Panels 52 to 54. Killed in action on the 2nd of July 1916, aged 25. Geoffrey St George Shillington Cather was born at Christchurch Road, Streatham Hill on the 11th of October 1890, the elder son of Robert Gabriel Cather, a tea merchant, and Margaret Matilda (née Shillington) Cather of “Red Roofs”, Limpsfield in Surrey, later of 35 Circus Road Mansions, St John’s Wood, London. He was sent to Hazelwood School Limpsfield in September 1900 and in the spring of 1905 went on to Rugby School where he was invalided home with a bout of scarlet fever in 1906. He had to leave Rugby in 1908, when in the upper fifth, following the death of his father. He joined the firm of Joseph Tetley and Co in the City of London, where his father had been a partner, as a tea buyer's assistant. He served as a Private in the 28th Battalion London Regiment (Artists Rifles) from 1909 to 1911. In 1912 he was posted by his company to the United States and Canada, returning on the 3rd of May 1914 on board the SS "Lapland", landing at Plymouth. When war broke out he enlisted as Private 196 in the 19th (2nd Public Schools Battalion) Royal Fusiliers in September 1914 from where he was commissioned as a 2nd Lieutenant in the 9th Battalion Royal Irish Fusiliers on the 22nd of May 1915. He embarked for France with his battalion as a platoon commander and landed at Le Havre on the morning of the 4th of October 1915. He became Assistant Adjutant of the battalion in mid November 1915 and was promoted to Lieutenant and appointed as Adjutant on the 7th of December 1915. He was mentioned in despatches. On the 1st of July 1916, the opening day of the Battle of the Somme, the 9th Battalion Royal Irish Fusiliers was detailed to attack the German lines to the south east of the villages of Beaumont Hamel and Beaucourt. The first wave of the battalion left the trenches at 7.10am and reached the shelter of a ravine facing the northern side of the village of Hamel . Twenty minutes later they attempted to go forward but came under intense machine gun fire. The following waves were mown down as they tried to reach the ravine. By nightfall 9 officers and 235 men had been killed or wounded and were lying out in no man's land. That evening, Cather went out into No Man's Land to help with bringing in the wounded. There was heavy German artillery and machine gun fire throughout the time he was carrying out this work but by midnight he had personally carried in three men. The next morning, at 8am, he went out again to assist the men who were still trapped between the lines. He was killed by machine gun fire at 10.30am. “On the night after the attack he went out and brought in numerous wounded; again about 7am the next morning, he was out again at the same work. He heard a man calling out and went over the parapet in broad daylight, gave him water, called to see if there was anyone else within hail, saw a hand waving feebly, went on and was shot through the head by a machine gun and killed instantaneously. So brave and fearless: such a fine character. As an Adjutant he was perfectly wonderful, and the Battalion has sustained a severe loss by his death. Of all the gallant band who laid down their lives that day, your son and two others stand out pre-eminently, whose loss I feel acutely. I cannot tell you what a help he has been to me, and I only now realise how much I leant on him. The smooth and efficient running of the Battalion machinery is due to him. All ranks feel his loss; the Brigade was greatly distressed on hearing of it. His example has made itself felt in the Battalion. Greater love hath no man than this, that a man lay down his life for his friends, and surely this he has done, and he has died a glorious death." “I was always greatly attached to him by the high-mindedness and unselfishness of his nature, and the longer I lived with him the stronger the bond between us seemed to grow. He was one who lived on a very high level, and yet he was always in full sympathy with his fellow creatures, and ready at all times to extend a kindly hand. His loss to the Battalion is indeed great, as he was especially fitted for the position of Adjutant, not only by his good mental gifts, but also by the sweetness and gentleness of his nature, which contributed not a little to the efficiency and splendid comradeship which pervaded all ranks. He has left behind with us all the happiest of memories, and by his noble self-sacrificing death, the highest of examples. We all very much hope that his name will be added to the list of gallant heroes who have gained the VC." His widowed mother received the VC from the King at Buckingham Palace on the 31st of March 1917. He is commemorated on the war memorial at Hazelwood School. He is commemorated on the Thiepval Memorial Pier and Face 15A. Thomas John Clinch was born at Sevenoaks the second son of Thomas John Clinch, a motor traction engine driver, and Winifred (née Tully) Clinch, of the Chart, Limpsfield and later of Blackman’s Cottages, Fairchilds, Whyteleafe, Surrey. He enlisted into the army at Guildford. On the 7th of June 1917 the British launched a massive attack on the Messines Ridge near Ypres which overlooked much of the British defences in the area. It was the opening day of what would finish months later in the struggle for the Passchendaele Ridge. It began with the detonation of nineteen deep mines which literally blew the German defenders off the ridge. At the time of the detonation (3.10am) the 8th Battalion East Kent Regiment was in assembly positions near Dickebusch having spent the night in two great dug outs, one of which held 400 men. Following the explosions there followed an enormous barrage as hundreds of artillery pieces joined the cacophony. The battalion was in support later near St Eloi and, at 11.30am, they moved forward to occupy the line already taken up by 41st Division. At 3pm an attack was launched during which the battalion reached its objective , known as the Green Line, with few casualties. The whole of the following two days the battalion held this position where they were shelled suffering a few casualties, mostly men of A Company which, with C Company, was in the front line. One of the victims of the shellfire was Thomas Clinch. Killed in action 26th September 1915 aged 21. Bertie Collins was born at Limpsfield the son of William Henry Collins, a bricklayer, and Emily (née Batchelor) Collins of The Chart, Limpsfield. Following his mother’s death his father remarried to May Mary (née Mitchell) at St Peter’s Church Limpsfield on the 27th of July 1912. He was educated at the National School, Limpsfield and worked as a domestic gardener when he left school. He enlisted into the army at Redhill. He landed at Boulogne with his battalion at midnight on the 31st of August 1915. From there they made their way to the front towards Loos where the British offensive was to begin on the 25th of September. They arrived at Vermelles on the afternoon of the 25th and were directed to prepare for an attack across the ground to the south of Hulluch Village. At 11pm on the 25th the battalion came under shell fire but experienced no casualties and at 2am on the 26th they reached the old German communication trenches which had been captured earlier and from which their attack was to be made. At 10.30am verbal orders were received that the attack would start at 11.15am the objective being far from clear. At the appointed time the battalion moved forward to the attack in extended order. As soon as they entered no man’s land they came under heavy shrapnel and machine gun fire, the latter growing heavier as they crossed the Lens- La Bassee Road and appearing to come from Hulluch which was supposed to be in British hands. On reaching the German front line they encountered a thick belt of uncut German barbed wire and the men lay down in a line while attempts were made to cut through it. Whilst they lay there machine gun fire swept back and forth from both flanks at close range. The task of cutting the wire under such circumstances proved impossible and the entire Brigade fell back to its starting point. The 8th Battalion lost a total of 12 officers, including their Commanding Officer, Lieutenant Colonel F.H. Fairclough, and 409 other ranks. He is commemorated on the Loos Memorial panels 13 to 15. Died of wounds 18th of October 1915. George Cook was born at Limpsfield the eldest son of Alfred Cook, a carpenter, and Louisa Cook of Wolf’s Row, Limpsfield. He was educated at the National School, Limpsfield. He was married to Adelaide Cook and they lived at North Cottage, Limpsfield; they had a daughter, Katherine. He worked as a groundsman before enlisting into the army at Croydon. 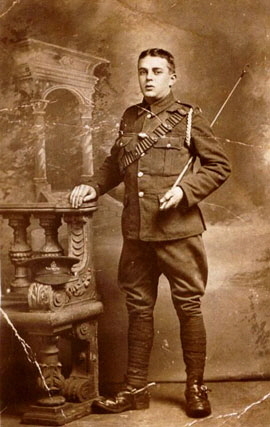 Private Cook was almost certainly wounded in the same attack as Bertie Collins but he survived long enough to be brought back to England where he died of his wounds. Died of wounds on the 14th of May 1918. John "Jack" Corke was born at The Chart, Limpsfield the son of Henry Corke, a farm labourer and Emily (née Sayers) Corke of Vicars Haw Cottages, Limpsfield. He was educated at the National School, Limpsfield after which he worked as a domestic gardener. He enlisted into the army at Oxted. In early May 1918 the 2/4th Battalion Queen’s (Royal West Surrey) Regiment was in positions at Ram-Allah on the Nablus Road six miles from Jerusalem. During this period the Turks mounted an attack on the 2/4th Queen's and their position on Ide Hill. The Queen's were forced out but reoccupied the trenches in a counter attack later the same day. It seems likely that John Corke was wounded around this time, was evacuated and died of his wounds at Jerusalem. He is buried at Jerusalem War Cemetery Row V Grave 41. Robert Frederick Cowlard was born at Limpsfield in 1881 the second son of John Cowlard, a general labourer, and Jane (née Filewood) Cowlard of Limpsfield. He was married to Alice Rosa Cowlard of Field House Cottage, Limpsfield and they had two children, Elsie Rosa and Ernest Frederick. He worked as a domestic gardener before enlisting at Guildford as Private 54313 in the 34th Battalion Royal Fusiliers and later transferring as Private 70336 in the Middlesex Regiment. He is buried at St Sever Cemetery Extension Rouen, Q II Row H Grave 6. 86th Company Machine Gun Corps. 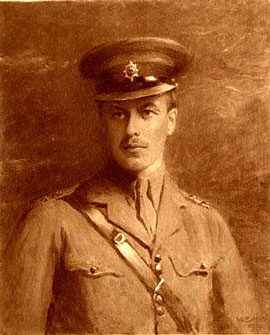 William Cowlard was born at Limpsfield Chart in 1890 the eldest son Frederick Cowlard, a domestic gardener, and Elizabeth Ann (née Marsh) Cowlard of Limpsfield Chart. He was educated at the National School, Limpsfield after which he went to work for seven and a half years as a footman at for Mr Brodie-Hoare of Tenchleys Park. When he left his employ he was presented with a silver watch which he “valued very highly”. He then went to work as a postman. Following the outbreak of war he made three unsuccessful attempts to enlist before he was accepted at Guildford where he enlisted as as Private G/18962 in the Queen’s (Royal West Surrey Regiment). He later transferred to the 86th Company, Machine Gun Corps. The 86th Company Machine Gun Corps was part of 86th Brigade of the 29th Division and were involved in the Battle of Broodseinde at the time of his death. “I’m afraid I cannot give you very much information. Pte. Cowlard was killed on the 5/10/17 during an attack made by this division . His officer was killed at the same time, which made a little confusion. As far as I know he was killed and buried at Langemarck village which is on the Ypres front. I am very sorry I cannot give you more definite details, but no doubt you will understand the difficulties one meets in a big advance. Will you please convey my deepest sympathies to his dear parents in their sad bereavement”. Killed in action on the 19th of November 1917, aged 22. Henry George Crittell was born at Limpsfield in 1895 the second son of Mark Crittell, a laundry worker, and Amy (née Sales) Crittell of Pains Hill, Limpsfield. He was educated at the National School, Limpsfield and worked as a gardener before enlisting in the Border Regiment at Redhill on the 2nd of September 1914. At his medical examination, which was held the same day, it was recorded that he was 5 feet 8 inches tall and weighed 132lbs. He had brown hair and blue eyes. He enlisted as Private 2000 in the 7th Battalion Queen’s (Royal West Surrey) Regiment also on the same day but they were most probably fully subscribed. Following his enlistment he served with the 7th Battalion in the UK and transferred to the 9th Battalion on the 24th of July 1915. He spent a period from the 27th of March 1916 to the 30th of April 1916 at the Northern General Hospital in Birmingham suffering from eczema and from the 4th of September 1916 he was posted to the 21st Training Battalion. He sailed from Folkestone for France on the 1st of January 1917and landed at Boulogne later the same day. He was based at a depot until the 23rd of January when he was posted to A Company, 2nd Battalion Border Regiment who he joined in the field on the 25th of January 1917. On the 26rd of June 1917 he was admitted to the 2/3rd Field Ambulance suffering from myalgia. He was admitted to 44 Casualty Clearing Station on the 30th of June. On the 9th of July he was released from hospital and returned to duty the following day. On the 14th of July he was re-admitted to 21st Field Ambulance suffering from the same complaint and was admitted to 9 Casualty Clearing Station on the 17th of July. On the 27th of July 1917 he transferred to No. 5 General Hospital at Rouen and on the 12th of August he was evacuated back to the UK on board the hospital ship “Warilda”. On the 20th of August 1917 he was admitted to the Military General Hospital at Plymouth. On his recovery he was granted a period of leave from the 1st of September to the 10th of September which he spent at home in Limpsfield and he joined the 3rd (Reserve) Battalion of his regiment on the 11th of September. He embarked at Folkestone on the 26th of October 1917 and landed at Boulogne later the same day. On the 27th of October he went to the Depot at Etaples from where he joined the 7th Battalion of his regiment in the field on the 3rd of November 1917 and was posted to D Company. He was killed while the battalion were holding the front line in either Eagle or Candle Trench in the Langemark area of the Ypres salient on battalion’s first day of a two week stint in the front line. He is commemorated on the Arras Memorial Bay 6. Stoker 2nd Class K/53702, HMS Pembroke. Sydney Crittell was born at Limpsfield on the 3rd of September 1900 the youngest son of Amos Crittell, a gas fitter for the Oxted Gas Company, and Louisa Crittell of Champion’s Cottages the Chart Limpsfield. HMS Pembroke was a training establishment. 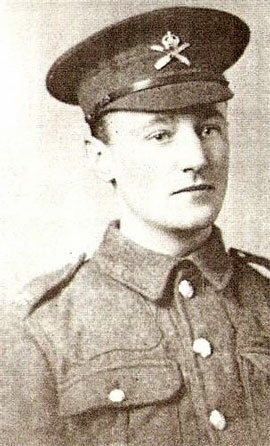 Crittell, William John Manuel (above) Private G/2087 A Company, 7th Battalion (Service) Queen’s (Royal West Surrey) Regiment. Killed in action 1st of July 1916 aged 21. William John Manuel Crittell was born on the 16th of July 1894 the eldest son of Mark Crittell, a laundry worker, and Amy (née Sales) Crittell of Pains Hill, Limpsfield. He was christened at All Saints Church, Warlingham on the 23rd of September 1894. He was educated at the National School, Limpsfield and worked as domestic under gardener before enlisting into the army at Redhill. he embarked for France with his battalion from Folkestone on board the SS "Victoria" on the 27th of July 1915 and landed at Boulogne later the same day. The 1st of July 1916 was the first day of what became the Battle of the Somme. This was to be the decisive “push” to break through the German lines once and for all. The British attacked on a 17 mile front, with many of the battalions involved being those raised by Kitchener in 1914 of which the 7th Battalion Queen’s (Royal West Surrey) Regiment was one. The 7th Queen's objective that day was a trench line about 200 yards to the north of the Montauban-Mametz Road. At 7.30am, along with tens of thousands of their fellows, they rose from their trenches and began to walk towards the German lines. There was expected to be limited opposition given that the Germans had faced a seven day bombardment of their lines which was expected to have extinguished all the defenders. The Germans, however, had been in very deep dugouts and many of them, and their machine guns, had survived the barrage. One group of the Queen’s under Lt D.R. Heaton crossed the German front line, but were stopped by “an unchecked hail of machine gun fire” from the German third line. They organised a bombing party which cleared the German line and they captured 163 prisoners. Another group, under Lt H.J. Tortiss captured the trench “Blind Alley” in similar fashion, capturing a further 12 German prisoners. In Montauban itself the battalion was held up by three enemy machine guns which Lieutenant Tortiss and a dozen men rushed, bayoneted the defenders and took the post. “Well done, it’s what I expected. Now hold on to what you have gained so splendidly.” Despite their appalling casualties, they were one of the few successful units on that dreadful first day. In all the battalion suffered casualties of 7 officers and 174 men killed with 9 officers and 284 other ranks wounded with a further 58 men missing, in all 532 casualties, part of around 58,000 for the British Army that day. Killed in action 26th October 1917. William John Doney was born at St Pinnock in Cornwall the son of Frederick William Doney, a farmer, of Tenchley’s Farm, Limpsfield and later of Haddocks Farm, Crockham Hill near Edenbridge. On leaving school he worked on the family farm before enlisting into the army at Harrow Road in London in late 1915. The 2/3rd (County of London) Battalion (Royal Fusiliers) was part of 173rd Brigade, 58th Division. On the 26th of October 1917 the brigade attacked from Poelcappelle, along the Westrrosebekke road, towards the high ground around Whitechapel and Papa Farm, and on towards a final line about 700 yards distant. The 2/2nd and 2/3rd Battalions led the attack. "Once again the assembly was beset with extraordinary difficulties. The conditions of the ground underfoot were appalling, and were to be a factor of delay both before the battle and during the battle itself. ....As it was, the troops were to push through the slush and water -logged craters 'according to plan'"
The assembly on the night of the 25/26th of October took no less than nine hours, and the 2/2nd didn't receive the barrage table, zero hour or situation maps until 8.30 p.m. on the night before the attack. The acting commanding officer of the 2/2nd, Major Miller, wrote: “The 2/2nds are ready to kill as many Boche as possible, and we are all happy to think of the possibility of doing a bit of slaughter." At 3 a.m. heavy rain broke and heavy enemy shelling killed or wounded many in the attacking companies. "To obviate conspicuousness, the men had been ordered to rub their steel helmets with mud, a task that demanded no special measures and was the simplest the battalion had to discharge that day." At 5.30 the attack jumped off or, as the history says "waded off", with the support of a “very very weak” barrage from the artillery. Although the supporting bombardment moved a rate of 100 yards in eight minutes it proved impossible for the battalion to keep up with it due to the appalling condition of the ground. 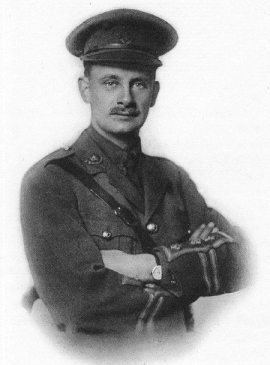 When the attack on the left flank by 57th Division failed, a German counter-attack fell against the Londoners, forcing them to give up most of the ground they had gained and leaving their commanding officer, Colonel Percy William Beresford DSO of Westerham, mortally wounded. The battalion had suffered casualties of around seventy men killed. Their strength on moving into the line on 24th October was 15 officers and 616 other ranks. On being relieved on the 26th they were down to 4 officers and 224 other ranks. He is commemorated on the Tyne Cot Memorial Panels 148 to 150. Killed in action 14th of April 1917, aged 38. Alfred Baverstock Dykes was born in Chelsea the son of Alfred Dykes, a coachman, and Harriett Dykes. He was educated at the Church School, Headcorn in Kent. He was married at St Peter's Church, Limpsfield on the 1st of August 1904 to Rhoda (née Webb); they lived at the High Street, Pembury and later at North Cottage, Limpsfield. He worked as a grocer and drapers assistant before enlisting into the army at Faversham in Kent. On the 14th of April 1917 the 24th Battalion Royal Fusiliers was engaged in the ongoing Battle of Arras. During the fighting the enemy had fallen back and at 3pm that day the battalion was ordered to advance until they made contact and then to dig in. They managed to get to within 500-600 yards of the Arleaux en Gohelle- Oppy line where they dug a new front line and support posts. Here they were unsupported on either flank where they came under heavy machine gun fire and an intense artillery barrage. They were relieved during the night having suffered a number of casualties. Alfred Dykes was among the dead. He is commemorated on the war memorial at East Grinstead. He is commemorated on the Arras Memorial Bay 3. Died in France on the 4th of April 1917, aged 34. Frederick James Fowles was born at Limpsfield the eldest son of Frederick James Fowles, a platelayer, and Zelia Minnie (née Canfield) Fowles of Limpsfield. He was christened at Limpsfield on the 8th of December 1884. The family moved to Somerset where his father worked as a railway timekeeper. He was married in 1904 to Alice Emma and they had two children, Frederick Thomas and John Richard. By 1891 the family were living at Binegar in Somerset where his father worked as a railway timekeeper. He initially followed his father into the railways also becoming a railway time keeper but later became landlord of the White Hart Inn, 6 London Road, Basingstoke. He enlisted into the army enlisted at Basingstoke. He is buried at Euston Road Cemetery, Colincamps, Plot 3 Row H Grave 9. Killed in action 15th July 1916 aged 20. George Norman Gearing was born at Tatsfield the son of Isabel (later Horsley) Gearing later of Margaretting, Ingatestone in Essex. He was educated at the National School, Limpsfield after which he worked as an under-gardener and lived at The Chart, Limpsfield. He enlisted at Guildford and embarked for France on the 1st of June 1915. On the evening of the 14th of July the 1st Battalion Queen’s (Royal West Surrey Regiment) received orders to join a general assault on a wide front as part of the ongoing Battle of the Somme. 100th Brigade (of which the Queen’s were part) was allotted the task of capturing the village of Martinpuich and High Wood on the Flers Ridge. They moved up to the front line on the night of the 14th being in position by 10pm. A and B companies were ordered to dig in while C and D remained in reserve. The area was very open and they were under enemy observation at a mile range with no covered approaches to the enemy positions. At 5am they received orders to attack the enemy trench known as the German Switch the orders were vague and the company commanders had very little information other than that they were to advance in a northerly direction on a 500 yard front. They were in position at 8am and at 8 .30am the British bombardment of the German trenches began with the first wave going over the top at 8.55am. The distance to the German trench was some 900 yards. While the companies were getting into position the enemy opened up with heavy artillery, rifle and machine gun fire and the British artillery was weak in its response. As soon as the first wave emerged from cover they came under intense fire but they pushed on as did the second wave which followed despite the hurricane of fire. When within 200 yards of the German position they were held up by trip wires which the Germans had placed there during the night. The Queen’s were held up and the situation soon disintegrated into a slaughter. At 9.25am a message came back from the A Company Commander Captain Foster that they were within 100 yards of the enemy line but the wire in front of the trenches was uncut, he asked for a renewed bombardment to cover their advance. The artillery responded with an ill aimed strike which fell so short that several rounds fell behind the Queen’s. They hung on until 12.30pm when, as no reinforcements had arrived, they were forced to withdraw to where they had started from. When they got back they were heavily shelled all afternoon and evening. Casualties for the attack were 5 officers and 28 other ranks killed with 11 officers and 207 other ranks wounded and 58 men missing. He is commemorated on the Thiepval Memorial Pier and Face 5D and 6D. 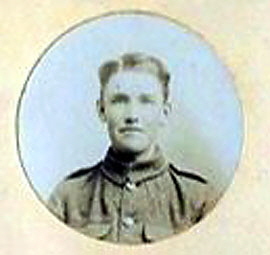 Head, George Frederick, Rifleman (above) 1874 1/18th (County of London) Battalion (London Irish Rifles). Died of wounds on the 26th of September 1915 aged 20. He was educated at the National School, Limpsfield and on leaving school he was employed as a draper’s assistant at Sir Frederick Cook’s in St Paul’s Churchyard in London and lived nearby. He volunteered for war service at Chelsea on the 11th of August 1914 and embarked for France on the 9th of March 1915. On the 25th of September 1915 the 1/18th (County of London) Battalion (London Irish Rifles) was part of 47th Division’s attack on the German lines at Loos. Their objective was the German second line which ran between the Loos-Bethune Road to Loos Cemetery. They began the attack by kicking a football in front of them. No man’s land was crossed without much difficulty but casualties began being suffered at the German front line but in spite of this the battalion pressed on to the second line. Here they met a thick belt of barbed wire but the trenches behind had few defenders and by 9am their objectives were taken. The battalion had suffered losses of 9 officers and 235 other ranks during the assault. George Head was wounded during the early part of the attack and died of his wounds the next day. He is buried at Noeux-Les-Mines Communal Cemetery Plot I Row B Grave 2. Killed in action on the 14th of July 1916, aged 26. Hayward Heath was born at Staffhurst Wood the son of Stephen Hayward Heath, a platelayer, and his first wife, Caroline Heath of Staffhurst Wood, Limpsfield, later of the Stores , Holland, Oxted. He was christened on the 23rd of February 1890. He worked as a labourer and served as Private 8267 in the 5th Battalion Queen’s (Royal West Surrey) Regiment (Militia) before enlisting as a regular soldier in the Queen’s (Royal West Surrey) Regiment at Guildford on the 21st January 1908. He underwent a medical examination at which it was recorded that he was five feet four and half inches tall, weighed 112 lbs, had a fresh complexion with hazel eyes and brown hair. After basic training he was posted to A Company, 2nd Battalion, based at Colchester on the 5th of May 1908. On the 3rd of January 1912 he embarked on HMS Soudan and disembarked at Bermuda on the 16th of January. On the 14th of August 1912 he was reported for drunkenness in and was confined to barracks for eight days. He served there until the 21st of January 1914 when he embarked on board HMT Somali bound for South Africa. He landed in South Africa on the 6th of February and served there until the 22nd of August 1914 when the battalion boarded the HT Knebworth Castle to return to the UK where they landed on the 19th of September 1914. He embarked for France with his battalion on the 4th of October 1914. He was promoted to Corporal in the field on the 22nd of December 1914 and reverted to the rank of Private at his own request on the 8th of July 1915. He was granted leave to the UK from the 11th to the 18th of September 1915. Early on the 14th of July the 2nd Battalion Queen’s (Royal West Surrey) Regiment moved by company and dug in at the head of Mametz Wood and Flat Iron Copse on the Somme. They did not go into action until late afternoon when at 5.35pm they were given orders to advance and attack High Wood, one of the strongest German positions on the front. The covering artillery barrage began at 6.15pm and they deployed at 6.45pm but there was a delay in their moving off so it was 7pm before the advance finally began. Their specific task was to capture Switch Trench to the north west of High Wood. As their advance began they were met with a heavy amount of machine gun fire from enemy troops positioned in shell holes. They were ordered to push on and attempt to outflank the machine guns. Several prisoners were taken and many of the enemy were killed with the assistance of cavalry and an aeroplane which supported them with strafing fire. At 7.45pm they took their objective and dug in. By the 16th the battalion had lost 1 officer and 47 other ranks killed and 10 officers and 211 other ranks wounded with 47 other men missing. He is buried in Caterpillar Cemetery, Longueval Plot X111 Row H Grave 3. Captain, 3rd (Reserve) Battalion Durham Light Infantry. Attached 2nd Battalion the Wiltshire Regiment. Killed in action on the 10th of March 1915 aged 39. He was the son of Mrs Robert Hoare of Court Hayes, Limpsfield and was the b rother of Basil Hoare later of Sutton Veny Wiltshire. He was attached to the 2nd Wiltshires arriving to join them on the 5th of December 1914. The 10th of March 1915 was the opening day of the Battle of Neuve Chappelle, the first attempt of 1915 by the allies to break the deadlock of trench warfare. 2.30pm. Here C and D Companies moved forward under “light” shellfire to the old British front line. At 5.30pm these companies were given the order to push forward and assist the 2nd Yorkshires at the old German front line at Min du Pietre 250 yards to the south of a position known as the Moated Grange. Due to confusion the advance did not begin until 6pm, during which time Captain Gillson was wounded in the leg and Captain Makin assumed command. The Wiltshires managed to move up the German front line led by their bombers and were at first very successful capturing an officer and 108 men of the 18th Infantry Regiment. By now A and B Companies were in support. After an advance of some 100 yards they were confronted by a wide, wet ditch where the Germans had built a flanking position and after a combat at close range involving “hot” rifle fire from the German trench which caused considerable casualties. It was at this time that Captain Hoare and Lieutenant Spencer were killed and the advance came to an end. Captain Hoare’s body was never recovered and he is commemorated on the Le Touret Memorial to the missing Panel 35. Killed in action 26th of October 1917 aged 35. Alan Brodie-Hoare was born at Caterham on the 9th of May 1882 the youngest son of Edward Brodie-Hoare MP, a banker, and Katherine (née Parry) Brodie-Hoare of “Tenchley’s”, Limpsfield. He was one of six children. He left Hazelwood School, where he played in both the cricket and football XIs for the school, at Christmas 1895 and went to Harrow School from January 1896 to 1901 where he was a boarder. He went on to Pembroke College Cambridge in 1901 and on leaving university he worked for the Bleachers’ Association at Firwood near Bolton. Following the outbreak of war he was commissioned as a 2nd Lieutenant in the 1/5th Battalion the Loyal North Lancashire Regiment on the 19th of October 1914; his older brother Maurice, born in 1879, was also commissioned as a 2nd Lieutenant in the 1/5th Battalion on the 7th of December 1914. On the 3rd of January 1916 he married Audrey Lois (née Collier) and they lived at 64 Napier Court, Hurlingham in London. He landed in France with his battalion on the 9th of February 1917 and was wounded (Times 28th of August 1917) whilst in the Armentieres sector of the line. On the morning of the 26th of October 1917 the battalion formed up at about 5am to attack an objective 1,000 yards away as part of the Battle of Polecappelle. At 5.40am they moved off in “impossible” conditions due to the rain and clinging mud which rendered many of the rifles and Lewis Guns unusable. Despite this the advance continued at a slow pace and, when the German positions were gained, much use was made of the bayonet. The battalion accounted for an estimated 500 Germans and captured or destroyed eight machine guns but sustained 288 casualties of all ranks. After the war Audrey remarried to Charles Gardiner and lived at Westcott in Surrey. He is commemorated on the Tyne Cot Memorial Panels 102 to 104. Wilfred Gurney Hoare was born at Jesmond on the 29th of May 1876 the son of Robert Gurney Hoare, a banker, and Annie (née Hoare) Hoare of Jesmond Dene, Newcastle-upon-Tyne, later of Court Hayes, Limpsfield and of 22 Portman Square, London. He was educated at Repton School where he was in Brook House from 1889 to 1893. He was commissioned as a 2nd Lieutenant in the 3rd Volunteer Battalion Northumberland Fusiliers on the 6th of January 1897 and was promoted to Captain on the 12 of July 1899. He was appointed as a 2nd Lieutenant in the 4th Battalion Durham Light Infantry (Militia) on the 7th of December 1901. He served in the South African war where he saw action at Cape Colony, the Orange Free State and in the Transvaal. He was awarded the Queen’s Medal with four clasps. He was promoted to Captain on the 25th of June 1904 and served as Musketry Instructor from 1905 to 1909. He resigned his commission on the 2nd of April 1910. He worked as a stock broker and lived at 11 Portsea Place, Connaught Square, London. Following the outbreak of war he applied for a commission in the 3rd Battalion Durham light Infantry, Special Reserve of Officers on the 5th of August 1914. 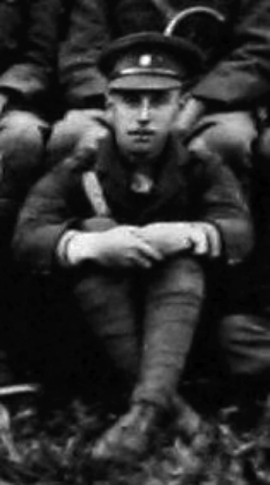 He was attached to the 2nd Battalion Wiltshire Regiment and joined them in the field on the 5th of December 1914. At 2.30am the battalion paraded near Nu Monde Crossroads under Captain Gillson and marched to Cameron Lane at 5.30am where they occupied the trenches there in the rear of the 2nd Gordon Highlanders. At 7.30am the British artillery commenced a bombardment which lasted about half an hour. All morning wounded men from the leading waves streamed past the waiting men. At 1.30pm they were ordered to advance and they moved forward with 25 yard intervals between the companies, arriving at the second support trenches to the rear of Neuve Chappelle at 2.30pm. Here C and D Companies moved forward once again under “light” shellfire to the old British front line. At 5.30pm these companies were given the order to push forward and assist the 2nd Battalion Yorkshire Regiment who were fighting in the old German front line at Min du Pietre, 250 yards to the south of a position known as the Moated Grange. Due to confusion the advance did not begin until 6pm, during which time Captain Gillson was wounded in the leg and Captain Makin assumed command. The Wiltshires managed to move up the German front line led by their bombers and were at first very successful capturing an officer and 108 men of the German 18th Infantry Regiment. By now A and B Companies were in support. After an advance of some 100 yards they were confronted by a wide, wet ditch where the Germans had built a flanking position. There followed intense combat at close range involving “hot” rifle fire from the German trench which caused considerable casualties. It was at this time that Captain Hoare and Lieutenant Spencer were killed and the advance came to an end. A number of interviews of eye-witnesses were interviewed to ascertain Wilfred Hoare's fate. "Captain Hoare was a most extraordinary, brave fellow, who had no sensation of fear at all. Informant saw him walking about under a hot fire at Neuve Chappelle, with the utmost coolness and indifference." "Capt. Hoare was killed on the first day at Neuve Chappelle on the 10th of March. At the time he was digging himself in behind the parapet of the German trench which they had just captured. I was not there myself but Capt. G. Main told me about it, and I know that he has written to the relation directly and told them all he knows. He did so immediately after the battle. Personally I went down to the field afterwards to look for the bodies of officers but could not find his. I heard afterwards that he had been buried by some other regt. but I cannot remember which. If, however, the family wrote to Main again I'm sure he could tell them it anybody could Hoare was an extremely brave fellow." He is commemorated on the Le Touret Memorial Panel 35. F Company, 3rd (Reserve) Battalion East Kent Regiment (The Buffs). Died on the 21st of June 1915 aged 24. Oliver Charles Howard was born at Titsey the youngest son of Alfred Howard, a labourer at Oxted Greystone Lime Works, and Sarah Howard of South Green Cottages, Titsey Road, Titsey, Limpsfield. He worked as a domestic gardener on the Titsey Estate. He enlisted in London on the 7th of June 1915 in the 3rd (Reserve) Battalion East Kent Regiment. At his medical examination, which was held the same day it was recorded that he was 5 feet nine inches tall and that he weighed 144lbs. He was posted to the Buffs Depot at Canterbury on the 12th of June and died of cerebra spinal meningitis at the Military Hospital, Dover nine days later. He is buried at St James’ Cemetery Dover Grave P.L.10. Royal Army Service Corps attached to 122nd Infantry Brigade Headquarters. Died of Wounds 23rd of May 1918 aged 23. Horace Charles Humpfrey was born at Limpsfield the son of Ephraim Humpfrey, a platelayer on the railway, and Emily Alice (née Hodge) Humpfrey of Partridge Farm, Staffhurst Wood, Limpsfield. He lived as a border at Beach Robin’s Farm, Staffhurst Wood where he worked as a waggoner’s groom before enlisting into the army at Tonbridge. He is buried at Bolougne Eastern Cemetery Plot IX Row A Grave 79. Killed in action 3rd of May 1917, aged 38. Robert Heath Humphrey was born at Limpsfield in 1878 the son of William Humphrey, an agricultural labourer, and Charlotte Humphrey of Red Lane Cottage, Limpsfield. He worked for 19 years as a gardener for Mr Horace Barry at The Gardens, Home Place Oxted; he was also a member of the Oxted Brass Band. He married Caroline Elizabeth (née Gravely) on the 11th of July 1903 at St Mary’s Church Oxted and they had four children, Rosina Charlotte, born on the 6th of May 1904, Ellen Caroline born on the 12th of February 1908, Gladys May born on the 4th of November 1912 and Alice Lily born on the 30th of May 1915. He enlisted at Oxted as Private 33157 in the Suffolk Regiment but later transferred to the Essex Regiment. On the 3rd of May 1917 the 2nd Battalion Essex Regiment was detailed to attack the heavily defended Chemical Works at Rouex. The attack moved off at 3.45am supported by a heavy barrage with “A” Company on the left and “C” Company on the right. The battalion war diary says they were met by “desolating machine gun fire which mowed them down in scores“. By 5am it was decided that the attack had failed. 14 officers and 207 other ranks had become casualties most of whom were listed as missing. One of the missing was Robert Humphrey. He is commemorated on the war memorial at Oxted. He is commemorated on the Arras Memorial to the missing Bay 7. Killed in action on the 31st of March 1918, aged 38. Harry Illman was born at Limpsfield and was married Ida Emily May (née Baxter) at the Congregational Church in East Oxted on the 2nd of December 1905. They had one son, Edward Alfred Henry who was born on the29th of June 1911 in Oxted. The family lived at 5 South View, Holland, Oxted and he worked as a gardener. He enlisted at Redhill on the 24th of June 1916 and was called up on the 27th of June 1917 when he underwent a medical at Guildford which recorded that he was 5 feet 6 ½ inches tall and he was classified as C1. He was posted for training in the 105th Training Reserve battalion at Edinburgh. He went to France on the 29th of September 1917 and was posted to the Labours Corps on the 6th of October. The following day he joined the 260th Area Employment Company Labour Corps at 5th Army Headquarters, 5th Army Infantry School. He was posted as missing on the 31st of March 1918 and was later presumed to have died on that date. His widow received her widow’s pension on the 3rd of February 1919. He is commemorated on the war memorial at Hurst Green. He is commemorated the Pozieres Memorial on Panel 94. Stoker 2nd Class HMS Pembroke. Died on the 25th of October 1918 aged 18. John Jarrett was born at Limpsfield on the 15th of July 1900 the son of Arthur Robert Jarrett, a stationary engine driver, and Charlotte (née Clapton) Jarrett of Mill Cottages, The Chart, Limpsfield. He was educated at the National School Limpsfield. He served at HMS Pembroke which was a naval training establishment. He is buried at St Peter’s, Limpsfield Churchyard. 1/7th Middlesex Regiment attached to B Company, 12th (Somerset Yeomanry) Battalion Somerset Light Infantry. Died of Wounds 6th of September 1918 aged 29. William Allan Keen was born at Limpsfield on the 4th of May 1889 the elder son of William Brock Keen, a chartered accountant, and Florence (née Hield) Keen of Edge Hill, Limpsfield. He was educated at Highgate School and in 1908 he went on to Balliol College, Oxford as a Classical Scholar, winning the Powell Prize in 1909 with a “striking” set of essays. In 1910 he achieved a First in Classical Moderations and in 1912 distinguished himself in the Jenkyns Exhibition and got a First in Literae Humaniores in the summer of that year. On leaving University he was called to the Bar at the Inner Temple gaining a certificate of honour in the examinations. He enlisted as Private K/C/2184 in the Inns of Court Officer Training Corps and volunteered for war service on the 26th of November 1914 being commissioned as a 2nd Lieutenant in the Middlesex Regiment on the 14th of March 1915. He served in Gibraltar and at Cairo and on the 1st of January 1916 he became Transport Officer of the 1/7th Battalion. On the 25th of February 1917 he became a Staff Officer at the Administrational Service Department at the General Headquarters in Amiens but applied to return to a fighting unit. He was promoted to Lieutenant on the 8th of May 1917 and to Temporary Captain on the 13th of March 1917 when he was attached to the West Somerset Yeomanry and then to the Somerset Light Infantry. For the next year he served in Palestine with the battalion and took part in the capture of Gaza in November 1917, the taking of Jerusalem and the assault on the Zeitun Ridge in December. In April 1918 the battalion was posted to France. On the 2nd of September 1918 the 12th Battalion Somerset Light Infantry was detailed to attack between the villages of Haut Allaines (on the right) and Moislains (on the left) with the objective of reaching the River Tortille and the Canal du Nord. B Company, commanded by Captain Keen, was to be in close support to A and C Companies who were in the vanguard of the attack. The companies assembled at 12.30am in their battle lines for an advance at 5.30am. During the night the Germans had moved machine gun posts into no-mans land in front of their trenches which would leave them unaffected by the British artillery barrage targeted on the German front line. At 5.30am the British artillery opened fire on the German front line and the men began to advance and immediately came under heavy fire from the German machine guns causing heavy casualties. By the time the Somersets had destroyed these nests they found that the artillery barrage had moved so far ahead of them that it was of little use in their support. On the right they captured 70 prisoners who were handed over to the Australian unit and by 8am they had taken their first objective being the east bank of the Canal du Nord. Orders were then received to push on a further 500 yards, which they did, creating a bulge in the German lines against which the Germans immediately counter attacked and despite losing a large number of men to the Somerset machine guns they forced the West countrymen back to their first objective. Twice the Somersets forced their way into the second objective and on both occasions they were thrown back. The Germans then subjected the survivors to artillery, shrapnel and gas attacks in their new positions but the positions were held. Captain Keen was wounded during the attack and died four days later. He is buried at Heilly Station Cemetery Mericourt-L’Abbe Plot VII Row B Grave 118. 1/7th Middlesex Regiment attached to the 16th (Service) Battalion. 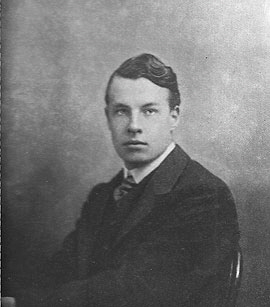 Arthur Clive Keen was born at Highgate in Middlesex the second son of William Brock Keen, a chartered accountant, and Florence (née Hield) Keen of Edge Hill, Limpsfield. He was a pre war member of A (Highgate) Company of the 1/7th battalion Middlesex Regiment and as a 2nd Lieutenant had been in a colour party when the King presented colours to 12 Territorial regiments of Dragoons and 96 Territorial infantry battalions on June the 19th 1908. On July the 24th 1908 he was part of a Guard of Honour for the Prince of Wales at the prize giving of the National Rifle Association at Bisley. He was an articled clerk to a firm of Chartered Accountants. At the outbreak of war he remained in the UK to raise a second battalion, acting as Adjutant at the depot at Hornsey. He later transferred to the 16th (Service) Battalion Middlesex Regiment. On the 8th of May 1917 he visited the 1/7th battalion at Tilloy-le-Mofflaines and the C.O. put in a request to transfer him back to his old battalion but he was killed two days later on the working party with the 16th Battalion near Monchy-le Preux. Killed in action on the 27th of May 1918 aged 25. William Charles Ledger was born at Tenterden in Kent the eldest son of Charles Ledger, a bricklayer’s labourer and Alice Ledger, a dressmaker, of Moor House, Westerham. He was and was educated at the National School, Limpsfield after which he worked as a gardener. He enlisted into the army at Tonbridge. �”Within a second a thousand guns roared out their iron hurricane. The night was rent with sheets of flame. The earth shuddered under the avalanche of missiles…leapt skyward in dust and tumult. Even above the din screamed the fierce crescendo of approaching shells, ear splitting crashes as they burst … All the time the dull thud, thud, thud of detonations and drum fire. Inferno raged and whirled round the Bois-de-Butte (23rd Brigade Headquarters). The dugouts rocked, timbers started. Men rushed for shelter, seizing kits, weapons, gas masks. Message pads as they dived for safety. It was a decent into hell”. After three hours of continuous bombardment at between 4 and 5am, the German infantry advanced to the attack. They broke through on either flank and attacked the support areas of a neighbouring division. It is not known exactly what happened to the 2nd Middlesex, but the commander of B Company reported that all was well at 4am and by 4.45am he reported that he was being overwhelmed by the enemy, there was only one officer and 21 men who survived from this company; effectively the battalion had ceased to exist. Private Ledger was among the dead. He is buried at Sissonne British Cemetery Row C Grave 10. Died of wounds on the 1st of August 1917 aged 21. Ronald Charles Gresham Leveson-Gower was born at Titsey Place, Limpsfield in Surrey on the 23rd of May 1896 the second son of Granville Charles Gresham MA JP DL and Evelyn Mildred (née Brassey) Leveson-Gower of Titsey Place. He was educated at the Reverend H Bull’s School at Westgate-on-Sea and then at Eton College from 1909 to 1914 where he was in Mr S.G.Lubbock’s House and where he won the Junior Rosebury History Prize in 1910. He was treasurer of his house debating society and Captain of House Games. He was also a Lance Corporal in the school Officer Training Corps just prior to the outbreak of war. He was commissioned as a 2nd Lieutenant in the 3rd (Reserve) Battalion Royal Sussex Regiment on the 15th of August 1914 and embarked for France on the 16th of May 1915. He was badly injured by the accidental explosion of a grenade in August 1915 following which he was invalided home and underwent a successful operation. He then transferred to the Special Reserve of the Coldstream Guards on the 1st of October 1916 and returned to the front with them in March 1917. On the 31st of July 1917 the 2nd Battalion Coldstream Guards were taking part in the opening day of what would later become known as the Battle of Passchendale. They advanced across the Yser Canal, passing through the 2nd and 3rd Guards Brigades and then moved on to secure the crossings over the stream known as Steenbeek. They attacked at 5.20am, advancing in two waves 150 yards apart. There was very little hostile shell fire while they were to the west of the canal which they managed to reach with only three casualties. At the canal the barrage intensified but was predicable enough for the commanders to get their troops forward during the gaps in the fire and by 6.20am the whole battalion got across the canal without a casualty. At the German trenches to the east of the Pilkem Road the fire became a lot heavier and casualties began to mount. As they crossed this trench and advanced towards the next line the machine gun fire became intense and Lieutenant Leveson-Gower was hit and mortally wounded; he died the next day. He is commemorated on the war memorial at Hazelwood School although there is no record of him being there. He most probably appears on the memorial because of the close connections his family had with the school. He is buried at Dozinghem Military Cemetery Row J Grave 1. Leveson-Gower, William George Gresham, Captain (above) 3rd Company 1st Battalion Coldstream Guards and Staff. Killed in action on the 9th of October 1918 aged 35. William George Gresham Leveson-Gower was born in Rio De Janeiro on the 12th of March 1883 the eldest son of Arthur Francis Gresham Leveson Gower and Caroline Frederica (née Foljambe), of Hadleigh House Windsor. He was educated at Summer Fields Preparatory School near Oxford from 1894 and at Eton from 1896 to 1901 where he a King’s Scholar and in College House. He was appointed as Captain of School in 1901. On leaving Eton he won a scholarship to Christ Church, Oxford where he became an MA 1st Class, Mods 1903, 2nd Class Lit Hum in 1905. In 1907 he became a clerk in the House of Lords and was called to the bar at the Inner temple in 1911. He joined the Inns of Court Officer Training Corps as a Private in the mounted infantry on the 12th of January 1907 and was promoted to Sergeant on the 1st of January 1910. He was commissioned as a 2nd Lieutenant on the 11th of October 1911 and was promoted to Lieutenant on the 21st of May 1914. He was seconded to the regular army on the 5th of October 1915. On the 15th of May 1916 he was appointed as a Temporary Captain to serve as a General Staff Officer 3rd Grade with Eastern Command and later with 67th Division until the 27th of December 1917 when he returned to the Inns of Court Officer Training Corps. On the 8th of March 1918 he transferred to the Coldstream Guards and, left for the front on the 10th of September 1918 where he joined the 1st Battalion of his regiment at the front on the 30th of September. At 5.20am on the morning of the 9th of October1918 the battalion found itself at the extreme left of the Guards Brigade line near Cambrai. 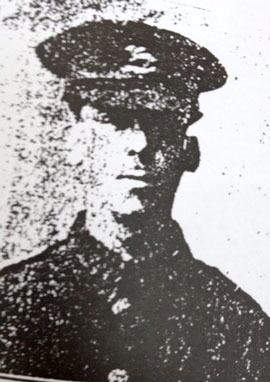 William Leveson-Gower was in charge of No.3 Company, despite the fact that he’d only been with the battalion for a week, it may be because of this, that his company was held in reserve. In the darkness, in intense cold, and under a British barrage, the leading companies worked their way forward to within 400 yards of their first objective, the La Targette-Cambrai Road, and at zero plus ten minutes they had taken it without opposition; during this time they took a few casualties from British shells which were falling short but they pushed on to the railway where they captured a few dugouts in the embankments and took a number of prisoners who were mostly wounded. They crossed the Cambrai- Le Cateau Road and brought machine gun fire to bear on some retreating limbers from a German artillery unit. They dug in on the other side of the road and it was at this time that Lt. Leveson-Gower was killed by a German shell. ”The death of Lieutenant Leveson-Gower is typical of so very many other similar cases that occurred in this cruel war, where a youth just budding into manhood entered the army, went through his training, and then arrived at the front to be cut off as soon as he got there. In the present instant this young officer joined his battalion full of hope and enthusiasm on the 30th of September, and within 10 short days he fell in his first encounter with the enemy”. In his last letter home written on the 7th of October Leveson-Gower wrote “It really is a fact that I am commanding a company in the Coldstream Guards, an ambition beyond my wildest dreams. In his will of the 29th of September a codicil was found leaving “remembrances” to 20 children. He is buried at Awoingt British Cemetery Section III Row H Grave 1. Herbert “Bertie” Lock was born at Limpsfield in 1898 the son of William Lock, a farm labourer, and Alice Lock of Ridlands Lane, Limpsfield. He enlisted into the army at Redhill. For details of the action he was killed in see also Private Bertie Collins. 6th (Service) Battalion Queen’s (Royal West Surrey) Regiment. Killed in action on the 1st of September 1915. William Alexander Lock was born at Limpsfield in 1894 the son of William Lock, a farm labourer and Alice Lock of Ridlands Lane, Limpsfield. He was educated at the National School, Limpsfield and work as an under gardener. He enlisted at Hythe in Kent and embarked for France on the 1st of June 1915. The 6th Battalion Queen’s (Royal West Surrey) Regiment arrived in France on the 6th of June 1915. They spent most of July, August and September in billets in Le Bizet or in the trenches at Le Touquet learning the trade of trench warfare from their more experienced colleagues. The battalion war diary for the 1st of September states that it was “very quiet all along the line” however, it also states that snipers from both sides were very active and that the Queen’s snipers claimed two victims. 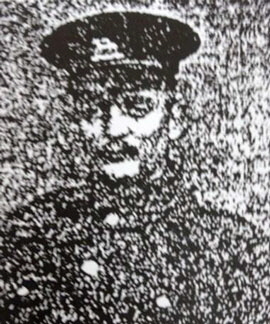 One other rank is recorded as being killed that day and it is assumed that this was William Lock. It would seem most probable that he was killed by a sniper. He is buried at Tancrez Farm Cemetery Row B Grave 20. Lieutenant Commander RN HMS “Donegal”, Royal Navy. Killed on active service on the 28th of April 1918 aged 34. Alexander Neville Lubbock was born at St Paul’s Cray Kent on the 2nd of November 1883 the third and youngest son of Sir Neville Lubbock KCMG, Deputy Governor of the Royal Exchange Assurance Company and Chairman of the West India Committee, and the only son of his second wife Lady Constance Ann (née Herschel) Lubbock of “Ridlands” Limpsfield Surrey. He entered the Royal Navy in 1897; on the 23rd of February 1899 he was posted as a Cadet to the cruiser HMS “Comus” and was appointed as a Midshipman on the 15th of May 1899. He then served on board the 4,360 ton cruiser HMS “Charybdis”. From 1903 he attended a course for Naval Instructors at the Royal Naval College, Greenwich and was promoted to Sub Lieutenant on the 9th of August 1903. He was posted to serve on board the cruiser HMS “Pandora” from the 23rd of March 1904 and from the 6th of January 1905 he served on board the armoured cruiser HMS “Monmouth”. He was promoted to Lieutenant on the 31st of December 1905. On the 30th of January 1906 he was posted to serve on board the armoured cruiser HMS “Argyll”. On the 19th of August 1908 he was posted to the cruiser HMS “Sappho” and later that year he joined the cruiser HMS “Proserpine” at Aden , along with other officers from “Sappho”, shortly after she was re-commissioned. He served with her during operations against gun runners and pirates in the Persian Gulf during the Somaliland expedition of 1908 to 1910. On the 24th of July 1909 he was posted to the cruiser HMS “Doris” and on the 24th of October 1910 he was posted to the cruiser HMS “Topaze”. On the 15th of May 1913 he was appointed as second in command of the cruiser HMS “Europa” and was promoted to Lieutenant Commander on the 31st of December 1913. On the outbreak of war he was sent out to Halifax in HMS “Good Hope” but was not on board her when she was later sunk. On the 9th of October 1914 he was posted to the battleship HMS “Exmouth”, rising to second in command of the ship. On the 28th of April 1918 he was a passenger on the 8,075 ton HMT “Oronsa” en route to join HMS “Donegal”. The ship had come from Talcaguano via New York on its way to Liverpool carrying a general cargo when it was attacked by a torpedo fired by U91. She sank in the St George’s Channel 12 miles west of Bardsey Island. Two other men died in the attack. His Captain wrote: �”I had not known him very long, but I know he was very popular with his mess mates―only a few days before his death I had written to the Admiralty to say how satisfied I was with him”. He is commemorated on a brass plaque at St. Andrew’s Church Limpsfield. He is commemorated on the Plymouth Naval Memorial. 1/4th Battalion Queen’s (Royal West Surrey) Regiment, attached to the 2nd Battalion Norfolk Regiment. Died on the 31st of January 1916. He was born at Limpsfield the son of Noah Lush, a domestic gardener, and Fanny (née Lockyer) Lush of 3 Church Cottages, Limpsfield. He was christened at St Peter's Church, Limpsfield on the 28th of July 1895. He was educated at the National School, Limpsfield. He worked as a gardener before enlisting into the army at Lingfield. At the start of the war the battalion was sent to India to relieve the 1st Battalion Iniskilling Fusiliers who were proceeding to the Western Front. In mid 1915, 50 men of the battalion under Lieutenant Jefferies were sent to Mesopotamia and attached to the 2nd Battalion the Norfolk Regiment. He landed in Mesopotamia on the 17th of August 1915. In December 1915 the Turks laid siege to the city of Kut where General Townshend and his garrison were trapped until their eventual surrender on the 29th of April 1916. During the siege, conditions for the defenders were atrocious and many of the troops succumbed to a variety of diseases, Wilfred Lush was one of these men. He is buried at Kut War Cemetery, Iraq. Died of wounds on the 18th of May 1916, aged 20. Walter John Luff was born at Limpsfield in 1896 the second son of Richard Luff, a cowman, and Kate Luff of Stonehall Cottages, Hurst Green in Oxted. He was christened at St Peter’s Church, Limpsfield on the 22nd of September 1896. He worked as a domestic gardener and he enlisted into the army at Guildford. He embarked for service in France on the 29th of June 1915. In mid May 1916 two companies of the 2nd Battalion Queen’s (Royal West Surrey) Regiment were in trenches at Bray on the Somme where they experienced occasional shelling. Killed in action on the 28th of September 1916 aged 36. Martin Henry Lloyd was born in 1880 the only son of James Martin of Hunton in Limpsfield. He was educated at Tonbridge School from 1893-1895. In 1895 he joined the Stock Exchange with Messrs. Martin and Hilder later joining A. Brampton and Co where he became a partner. He was scoutmaster of the Lingfield and Dormansland Troop and was District Scoutmaster of the East Surrey Association. He was commissioned as a Temporary Lieutenant in the 7th Battalion Queen’s (Royal West Surrey) Regiment on the 23rd of September 1914 and was promoted to Temporary Captain on the 13th of March 1915. On the 27th of July 1915 he embarked with his battalion on board the SS "Victoria” and landed at Boulogne. He served with the Battalion both as Intelligence Officer and as commanding officer of B Company. On the 25th of May 1916 he was slightly wounded by an accidental explosion of bombs behind the lines and he was slightly wounded in the battle for Trones Wood on the 13th of July 1916. On the 28th of September Captain Martin was in command of B Company when they were detailed to attack the notorious Schwaben Redoubt on the Somme. During the attack he was killed by a shell and died instantly. �”He found nothing too much to do for the boys, though he never spoilt them. It was just typical of him that, when on leave, he spent a whole day in seeing boys and parents. He was so absolutely sincere and with such high ideals that his life told on these boys in a wonderful way”. 8th (Service) Battalion Princess Charlotte’s Own (Royal Berkshire) Regiment. Killed in action on the 19th of September 1918, aged 19. Alfred George Nash was born at Limpsfield in 1899 the eldest son of Alfred Nash, a grocer, and Mary Grant Nash later of 55 Longford Street, Derby. He enlisted at Coventry as Private 43017 in the Hampshire Regiment, later transferring to the Royal Berkshire Regiment. He is commemorated on the Vis-en-Artois, Memorial Panel 7. Died on the 22nd December 1916. Arthur Nicholls was born at Devizes in Wiltshire and was married to Jane (née Hammerstone) at the Roman Catholic Chapel at Ware in Hertfordshire on the 7th of January 1905. They lived at Pebble Hill Limpsfield where he worked as a general labourer, later becoming a coachman. He enlisted at Edenbridge as a Driver in the 22nd Reserve Park, Royal Army Service Corps on the 31st of May 1915. At his medical it was recorded that he was 5 feet four and a half inches tall and that he had the scar from a horse bite just below his left scapula. He embarked for France at Southampton on the 23rd of August 1915 landing at Le Havre the following day. On the 15th of September he was attached to the 131st Howitzer Brigade at Rouen. On the 15th of December 1915 he was admitted to hospital and was considered dangerously ill with double pneumonia for the next two days. On the 31st of December he transferred to hospital at St Omer. He remained there in a serious condition until being released to base on the 1st of March 1916. On the 2nd of March he was admitted to hospital at Camiers and was evacuated back to the UK on the 4th of March 1916 where was admitted to 3rd Western General Hospital at Cardiff on the 6th of March 1916 suffering from emphysema and pneumonia. He was discharged from hospital on the 5th of May 1916 and granted a period of sick leave. On the 16th of May 1916 he attended a Medical Board at Scatton Camp, Catterick where he was found to be fit for general service. On the 18th of May, while still at Catterick, he was charged with making a falsehood to an NCO and the loss of a pair of ankle boots to the value of ￡1, for which he was confined to barracks for seven days. He was in No. 1 Company and embarked for service in Salonica on the SS Nihonian on the 23rd of July and disembarked at Salonica on the 6th of August. Although he is listed as being with the 22nd Reserve Park this unit became the 12th Auxiliary Horse Transport Company (208th Company) Army Service Corps, part of the 26th Division, before proceeding to Salonika .It was the responsibility of a Reserve Park to hold and maintain sufficient supplies to keep an infantry division in rations for two days. To achieve this each park was equipped with 59 General Service wagons, 2 forage carts, 1 light Maltese cart and a water cart. To pull these 359 draught and riding horses were allotted to each park. Such horses were requisitioned from all parts of Southern England and most of them were “shires” or Clydesdales. On the 13th of July 1916 the 22nd Reserve Park received orders to mobilize for Salonika and on the 17th of July they entrained for Avonmouth, setting sail for Devonport on the 18th on the SS “Celtic King” and the SS “Alwyn Castle”. Over the two days of the 22nd and 23rd they embarked on the SS “Nitonian”, SS “Caledonia” and SS “Elele”. They arrived in Salonika on the 6th of August. In October they deployed: 1 and 2 Section were despatched to Lembet, No.3 Section to Kalamaria and No.4 Section to Dudular. On the 22nd of December 1916 he was suffering from dysentery, an illness he had suffered from before during his time in Salonica and was placed on board an ambulance train to be evacuated for treatment at No. 5 Canadian General Hospital. He was found dead at 16.45 hours on board an ambulance which was travelling in convoy from the train. Osmaston, Robert Shirley 2nd Lieutenant MC (above) 3rd Battalion Royal Sussex Regiment and 23 Squadron Royal Flying Corps. Killed in action 24th September 1916 aged 22. Robert Shirley Osmaston was born at Hampstead on the 17th of November 1894 the second son of Francis Plumtree Beresford Osmaston, a gentleman, and Eleanor Margaret (née Field) Osmaston of Stones Hill, Limpsfield. He was educated at Earleywood Preparatory School, Ascot and at Winchester College from 1909 to 1913 where he was in Kingsgate House. He gained the gold medal for gymnastics in 1912, and was an excellent boxer. He had started a short course in agriculture but this was interrupted by the outbreak of war when he enlisted as Private 19/729 in 19th (Public Schools) Battalion Royal Fusiliers. He was commissioned as a Temporary 2nd Lieutenant on the 18th of May 1915 in the 3rd Battalion the Royal Sussex Regiment this rank was confirmed on the 20th of December 1915. He embarked for France on the 30th of November 1915 where he was attached to the 2nd Battalion Royal Sussex Regiment. Early in 1916 he was a Lewis Gun instructor and was attached to Brigade Headquarters as Acting Adjutant to his brigade while he was there learning staff work. In July 1916 he transferred to the Royal Flying Corps and on the 24th of September 1916 he was observer in FE2b 4857 piloted by 2nd Lt J.C. Griffiths, when they were attacked at close quarters by a Roland over Bertincourt. Before Osmaston could man the rear machine gun he was shot through the head and killed. Although Griffiths was wounded and the aircraft’s engine was damaged he successfully landed the aircraft at Millencourt. The Roland was itself shot down moments later by 2nd Lt K.L. Gopsill and 2nd Lt F.W.A. Vickery in FE2b 6964 also of 23 Squadron. The German crew appear to have survived the encounter. He is commemorated on the war memorial at Winchester College. He is buried at Beauval Communal Cemetery Row A Grave 18. Pelham-Burn, Arthur Sidney 2nd Lieutenant (above) 1/6th (Banff and Donside Battalion) Battalion Gordon Highlanders. Sidney Pelham-Burn was born on the 30th of June 1895 the third son of the Venerable William Pelham-Burn, Archdeacon of Norfolk and Alice Marguerite Gordon (née Rate) Pelham-Burn of Sandy, Limpsfield in Surrey. He was educated at Lancing College where he was in Seconds House from May 1910 to July 1914. He suffered with ill health in his early years at Lancing but went on to be appointed as a House Captain in May 1913, a Prefect in January 1914 and was a Sergeant in the Officer Training Corps where he achieved Certificate A. He won his House Colours for Football. While at school he served in the chapel as School Sacristan and had hoped to take holy orders, having matriculated for New College Oxford (1915 entry), but joined the army instead. He was commissioned as a 2nd Lieutenant in the 6th Battalion Gordon Highlanders on the 14th of October 1914 and, after a period of training with his battalion at Bedford; he sailed for France with his battalion, landing at Le Havre on the 10th of November 1914. By Christmas day the Battalion was in the trenches near the Sailly-Fromelles road to the west of Lille where the trenches were only 60 yards apart. During the Christmas truce both sides emerged from their trenches to bury more than 100 bodies from both sides that were lying in no man’s land from the previous fighting. “...awful, too awful to describe, so I won’t attempt it. A service of prayer was arranged and amongst them was a reading of the 23rd Psalm and an interpreter wrote them out in German. They were read first in English by our Padre and then in German by a boy who was studying for the ministry. It was an extraordinary and wonderful sight. Arthur Pelham-Burn was slightly wounded during the battle and was mentioned in despatches for his bravery. On the 2nd of May 1915 he was in the trenches when he was shot and killed by a sniper. "I was struck at once by his intelligence and keenness throughout; he had a remarkable habit of command with his men, who were most attached to him....the battalion has lost in him one of its best and most experienced officers....he won the affection of his men to a remarkable degree and their confidence in him , was amply vindicated in the fine way he led then at Neuve Chappelle." "I can't tell you what those services meant and do mean to me now. I can only pray that one day I may be allowed to come back to the Chapel." In the Advent term of 1916 his school friend, 2nd Lieutenant Hubert Cecil Charles Riley Coldstream Guards, presented a brass tablet to be placed in his memory in the floor of the south aisle of the school chapel. His brother, Lieutenant Maurice Edward Pelham-Burn 8th Battalion Black Watch, was killed in action on the 9th of April 1917. He is commemorated on the war memorial Lancing College. He is buried at Estaires Military Cemetery II Row A Grave 1. Killed in action 9th of April 1917. Age 23. Maurice Edward Pelham-Burn was born on 5th of July 1893 the second son of the Reverend William Pelham-Burn Archdeacon of Norfolk and Alice Marguerite Gordon (née Rate) Pelham-Burn of Sandy, Limpsfield. He was educated at Repton School from September 1906 to April 1911. 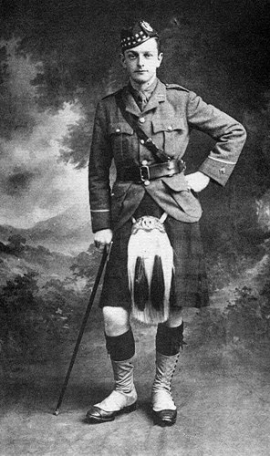 He was commissioned as a 2nd Lieutenant in the 8th Battalion the Black Watch in August 1914 and was promoted to Lieutenant in May 1915. He served in France from May to August of 1915 when he was wounded. He returned to France to rejoin his battalion on the 14th of January 1917. On the 9th of April 1917 the 8th Battalion Black Watch was part of the Arras offensive and was detailed to capture the village of Athies. First they had to overcome three lines of German defences. The bombardment for the attack had lasted for three days when, at 5.30am, the leading companies left their trenches in four waves fifteen yards apart. Due to the confusion the battalion was soon in a single line, sweeping forward. Little resistance was met at the German first line with the garrison being anxious to surrender after the long barrage, 150 men were captured here. By 6.10am the trench had been consolidated but, although casualties had been light Maurice Pelham-Burn was killed with another officer wounded and 60 casualties amongst the other ranks. His brother, 2nd Lieutenant Arthur Pelham-Burn 1/6th Battalion the Gordon Highlanders, was killed in action on the 2nd of May 1915. 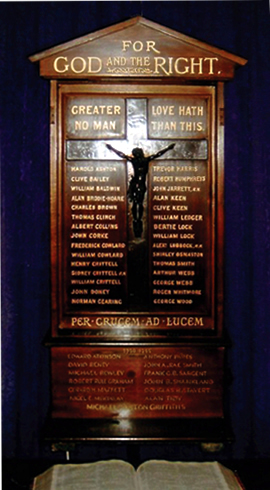 He is commemorated on the war memorial at St Matthew's, Church Bethnal Green. He is buried at Cabaret-Rouge British Cemetery, Souchez Row Q Grave 23. 1/16th (County of London) Battalion (Queen’s Westminster Rifles). Killed in action 8th of January 1915 aged 34. Richard du Rupe Roche was born at Ventnor on the Isle of Wight the elder son of Captain Richard Roche RN and Maria Jane Roche. He enlisted as a trooper in the 50th (Hampshire Company) 17th Battalion, Imperial Yeomanry in February 1900 and served in South Africa from April 1900 to July 1901. He was dangerously wounded at Rondal in March 1901. He was awarded the Queen's Medal with five clasps having seen action at the Cape Colony, Rhodesia, the Orange Free State and in the Transvaal. On his return he enlisted in the Queen’s Westminster Rifles and became a well known shot at Bisley, competing internationally and representing Ireland there on several occasions. He was awarded the Territorial Force Efficiency Medal in October 1911. He was married to Ethel (née Fulton) Roche of Culver Cottage, Fletcher Road, Horsell, Woking and worked as a motor cab driver in London. Following the outbreak of war he was mobilised on the 5th of August 1914 and He went embarked with his battalion at Southampton on board the SS"Maidan" and landed at Le Havre the following day. On the 24th of November they entered the trenches for the first time taking over a six hundred yards section on the line between La Houssoie and the Boulogne-Lille Road north west of Wez Macquart. On the 30th of November Corporal Roche went on a night patrol in no man’s land with Lieutenant J.B.Baber. They were working their way along a ditch some way in front of the lines when they found themselves surrounded by three different enemy patrols that appeared to have agreed to rendezvous at a certain spot. The first two passed the ditch where Roche was crouching without spotting them but the third party, consisting of three men, headed straight towards the two men. Roche opened fire killing one of them and rushed the remaining two causing them to drop their weapons and surrender. They belonged to the 179th Regiment. On returning with the prisoners they were fired upon by an overzealous British machine gun but without mishap. For this action he was mentioned in despatches in the London Gazette of the 22nd of June 1915. On Christmas Day the battalion met the Germans in no man's land where they exchanged gifts and sung carols. On the 8th of January 1915 the battalion was in the line at Houplines and Corporal Roche left the trench as it was beginning to get light to get some water for his gun. He was not missed until it was fully light and was seen lying 120 yards away behind the trench in the open and in full view of the Germans in the line opposite. It was considered almost certain death to try to reach him. Nevertheless Rifleman R.H.A Tibbs and Rifleman Pouchot of Number 2 Company grabbed a stretcher and crossed the ground under fire to try to reach him. They found him dead, Tibbs being killed by enemy fire as he knelt next to him. Pouchot, seeing that both men were dead managed to return to his lines and was awarded the Distinguished Conduct Medal for his bravery, the first gallantry medal the battalion was awarded during the war. He is buried at Houplines Communal Cemetery Extension Plot III Row 3 Grave 19. Seal, Frank, Gunner (above) 65571160th Siege Battery Royal Garrison Artillery. Died of wounds 26th of June 1917 aged 20. Frank Seal was born in Edenbridge the son of James Seal, an agricultural labourer, and Eliza Seal of Shingle Cottage Edenbridge. He was educated at the National School, Limpsfield after which he became a labourer. He enlisted at No. 1 Depot, Royal Garrison Artillery at Guildford on the 2nd of November 1915 and qualified in signalling during his training. He embarked for France at Southampton on the 18th of September 1916 and landed at Le Havre the following day. He was wounded on the 26th of June 1917 and was evacuated to 2 Canadian Casualty Clearing Station where he died from a fractured skull later the same day. He is buried in Lijssenthoek Military cemetery Plot XV Row D Grave 3A. Killed on active service on the 3rd of June 1915 aged 23. William Henry Shore was born at Sundridge in Kent on the 18th of May 1892 the son of Harry Shore, a plumber, and Dora Shore of Rose Cottage, Limpsfield. He was educated at the National School, Limpsfield after which he worked as a decorator. He enlisted into the army at Croydon. The 1/1st South Eastern Mounted Brigade Transport and Supply Column was a Territorial Army unit based in Croydon and they mobilised on the outbreak of war departing to Canterbury on the 12th of August 1914 where they remained until their departure for Gallipoli in September 1915. While they were in Canterbury, William Shore was killed in a motor accident. Killed in action 25th of September 1915 aged 36. Edward John Smith was born in Oxted the son of Thomas A Smith. He was educated at the National School, Limpsfield, lived at Limpsfield and was married to Rosina (later Hardy) later of 2 Cave Cottages, Godstone Surrey. He enlisted into the army at Guildford. The 2nd Battalion Queen’s (Royal West Surrey) Regiment was in support of other battalions from their Brigade in the assault to the right of the German position known as Fosse 8 on the opening day of the Battle of Loos. When they moved forward, “C” company found that the first two German lines had been taken by the leading units, the other companies, however, were met with stiff resistance but carried and consolidated these positions, after which they were directed to Cite St Elie where they established themselves in the German trenches 150 yards north of the village, entering it at around 2pm. These men were later forced out of the village and forced to fall back to the new line. It was during this engagement that Edward Smith was killed. Recruit's Depot Royal Flying Corps. Died on the 4th of June 1916 aged 34. Henry “Harry” Smith was born at Enfield in Middlesex the second son of George Smith, a gardener, and Julia Smith later of Forge Cottage, Limpsfield and later of Burford, Brant, Ontario in Canada. He was educated at the National School, Limpsfield after which he worked as a domestic gardener and later as a domestic house porter. He was based at the Royal Flying Corps, Recruit's Depot. Smith, Thomas John G/744 Private. Killed in action 3rd of July 1916. Thomas John Smith was born and lived in Limpsfield. He was educated at the National School, Limpsfield and enlisted in Redhill. At 3.15am on the morning of the 3rd of July the 6th (Service) Battalion Queen’s (Royal West Surrey) Regiment climbed out of their trenches and led the assault of 36th Brigade on the German positions at Ovilliers, a village which had resisted British attempts to take it two days earlier on the opening day of the Battle of the Somme. Men from B Company, in the first wave, got to the enemy front line but the majority of the officers and men were killed or wounded by rifle and machine gun fire. Men from C Company also in the first wave were stopped by the German wire which remained uncut and they too were decimated by machine gun fire. Seeing the near complete failure of the first two companies the attack of D Company was stopped. At 4.30pm they were sent forward and were cut to pieces by machine gun fire killing or wounding all their officers. Total casualties for the battalion were 2 officers and 23 other ranks killed, 8 officers and 154 other ranks wounded and 117 other ranks were posted as missing. 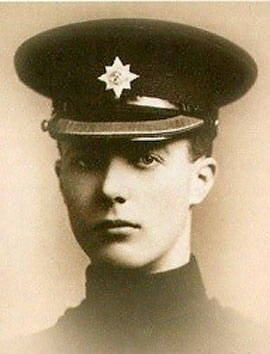 Snelling, Edward Thomas Driver 88992 (above) 12th Divisional Ammunition Column, Royal Field Artillery. Died of wounds 10th of April 1917. Edward Thomas Snelling was born at Limpsfield the son of James Snelling, a farm labourer, and Alice Snelling of Grubb Street, Limpsfield. He was christened on the 14th of February 1897 at St Peter’s Church in Limpsfield. He was educated at the National School, Limpsfield after which he worked as a telegraph messenger. He enlisted at Redhill as Private 46478 in the 6th Battalion Queen’s (Royal West Surrey) Regiment and embarked for France on the 1st of June 1915. He later transferred to the Royal Field Artillery. He is buried at Duisans British Cemetery, Etrun, Row H Grave 10. Arthur Stephen Stringer was born at Limpsfield on the 27th of June 1891 the son of William Stringer, a general labourer, and Annie (née Tamplin) Stringer of High Street, Limpsfield. He was educated at the National School, Limpsfield after which he worked as a groom. He enlisted in Croydon on the 14th of October 1914 and left for India on or about the 20th of October and after some time there he volunteered for service in the Persian Gulf where he was attached to the 2nd Battalion Norfolk Regiment. He landed in Mesopotamia on the 12th of May 1915. While he was there he was taken ill in December 1915 and died of pneumonia during the siege of Kut on 31st December 1915. For details see those of Private Lush. 7th (Service) Battalion Queen’s (Royal West Surrey) Regiment. Killed in action 24th of October 1918 aged 23. Only days away from the end of the war the 7th Battalion Queen’s (Royal West Surrey) Regiment was part of the pursuit of a retreating German army. They were marched to Le Cateau on the 23rd of October 1918 in preparation for an attack the next day. Other units were set four objectives for the attack with the 7th Queens detailed to take the fifth one. By 8.25am on the 24th of October the Queens had gained a foothold in the western outskirts of the village of Robersart. German machine guns, sited in the windows of the buildings caused many casualties and held the advance up until 6pm when, supported by other units, the Queens advanced as far as the village church. Harry Stringer was one on those who fell. A Company, 17th (Service) Battalion Duke of Cambridge’s Own (Middlesex) Regiment. Killed in action on the 28th of April 1917. He was born at Titsey the son of John Terry, an agricultural labourer and Sarah Terry of Middlebarn, Titsey, later of Copthall Cottage in Westerham. He was married to Mary and they lived at Hosey Hill in Westerham where he worked as a house painter. He enlisted in Westerham as Private 7555 (SDGW 8901) in the Royal West Kent Regiment but later transferred to the Middlesex Regiment. On the 28th of April 1917 the 17th Battalion Middlesex Regiment was detailed to capture German positions at Oppy Village. They attacked at 4.30am and approached the village through the nearby wood. They took the German front line trench on the western outskirts of the village but were later driven out and were forced back to their starting positions. Only 42 of the attackers answered roll call that night. He is commemorated on the Arras Memorial Bay 7. Died of wounds on the 3rd of August 1916, aged 32. George Webb was born at Limpsfield the third son of George Webb, a bricklayer, and Rhoda Webb of North Cottages, High Street, Limpsfield. He worked as a grocer’s assistant before moving to Sussex where he became an assistant at a tailors and outfitters. He lodged at a boarding house at 4 Old Malt Cottages, Steyning. He enlisted into the army at Hove. On the 3rd of August 1916 the 17th Battalion Royal Fusiliers moved up and took over the front line at Waterlot Farm on the Somme. At 8.30pm and again at 9pm there were bursts of shell fire on their positions. At 10pm the Germans opened a heavy bombardment which continued until dawn the following day. When it finished 4 men were dead and 8 wounded. George Webb was one of the dead. He is buried at Corbie Communal Cemetery Extension, Plot 2 Row A Grave 33. Killed in action on the 28th of March 1918. Frank Wadmore was born at Mitcham the son of Frank Wadmore a varnish carman, and Rose (née Thompson) Wadmore of Tidy’s Green, Limpsfield. He worked as a butcher and enlisted into the army at Croydon. On the 21st of March 1918 the Germans launched massive attacks against the British lines resulting in a wholesale retirement across much of the old Somme battlefields of 1916. By the 27th of March the 6th Battalion Queen’s (Royal West Surrey) Regiment was holding the village of Hamel. At 2.15pm that day, preceded by a heavy artillery bombardment, the Germans launched a strong attack against the village. They succeeded in driving the Queens out. The survivors formed a line 250 yards south of a road junction to the south of the village; here they built a series of strong points during the night. During the 28th the Germans massed in front as if to attack but instead subjected the Queen's to a massive artillery barrage during which Sergeant Wadmore was killed. He is commemorated on the Pozieres Memorial Panel 14 and 15. Killed on the 20th of September 1917 aged 19. Arthur Webb was born at Limpsfield the elder son of Peter Webb, a gravel digger, and Annie Webb of Moor House, Westerham. He was educated at the National School, Limpsfield after which he worked as a general labourer. He enlisted into the army at Redhill. On the 20th of September 1917 the 1/9th Battalion Royal Scots was at the vanguard of an attack on German trenches in the village of Poelcappelle, as part of the offensive generally known as the third Battle of Ypres or Passchendaele. The attack was launched at 5.40am in appalling conditions. The field was a morass of interconnecting, flooded shell holes and the mud clung to their every step. The objective was Pheasant Trench and “advancing with great skill and gallantry they moved from shell hole to shell hole in twos and threes, pouring rifle grenades and rifle fire into the German defenders.” They carried the German position on the right of the attack and occupied it. On the left of the attack, however, the attackers of “B” company were met with heavy fire and forced to retire to their own positions. There they were rallied by their officers and together with men of the Argyll and Sutherland Highlanders, carried the day and completed the occupation of the enemy position. It was during this action that Arthur Webb lost his life. He is commemorated on the Tyne Cot Memorial Panels 11 to 14 and 162. Killed in action 7th March 1916 aged 23. He was the son of the and Annie late Peter of Moorhouse, Westerham Kent. During the period when George was killed, the 6th Queens were holding the line in the area of the old Loos battlefield, between the Quarries and the Hohenzollern Redoubt. This was a period of intense mining and counter-mining by both sides and in March of 1916 the British exploded a number of mines in attempt to destroy the German galleries below the British trenches. The explosions were followed by British troops rushing forward to fight for possession of the craters. It is not known how Private Webb died but he is buried at Vermelles British Military Cemetery Plot II Row H Grave 1. Private T/3280, 2/ 4th Battalion the Queens (Royal West Surrey) Regiment. 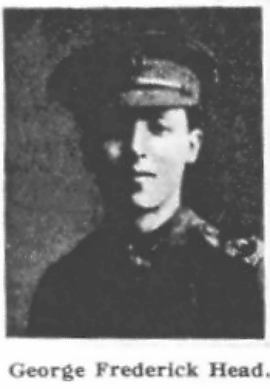 Killed in action 9th of August 1915 in Gallipoli, aged 21. The Battalion, 900 strong, entrained for Devonport on July the 16th 1915 embarking in the SS Ulysses for an “unknown destination”. Having dropped 150 men, for reinforcement purposes, under Captain Twining at Port Said they headed for the beaches of Gallipoli. Since the landings of the 25th of April 1915 the advance had stalled and plans were laid to relieve the operation by making fresh landings at Suvla to the north of ANZAC Cove. “As to you, soldiers of the new formations, you are privileged indeed to have the chance vouchsafed you of playing a decisive part in events which may herald the birth of a new and happier world. You stand for the great cause of freedom. In the hour of trial remember this, and the faith that is in you will bring you victoriously through”. The 11th Division landed at Suvla before dawn on August 7th but did not play a part in the growing battle until ordered forward on the 9th of August. They set off before dawn along with the 1/4th Royal Sussex to a spot to the west of Chocolate Hill where they were ordered to entrench. Shortly afterwards the Queens were ordered to join 31st Brigade on Hill 53 and set off in artillery formation across the southern side of the Salt Lake, coming under shell fire and incurring several casualties. On arrival at Hill 53 they were attached to 33rd Brigade and were ordered round to the northern slope of the hill to consolidate a position and support the hard pressed troops in their front. This was achieved by 9am. The 2/4th Queens stormed and gained the top of Hill 53 where they came under heavy fire and for a time were forced to retire; but advancing again the crest was recaptured, until the position had to be abandoned due to the scrub catching fire. The Battalion had lost 8 officers and 250 other ranks killed wounded and missing, many of the wounded burning to death in the scrub fire. Private Webster’s body was never recovered and he is commemorated Helles Memorial panel 30 and 31. Captain, 1st Battalion, “D” Company King’s Shropshire Light Infantry. Killed in action on the 20th of November 1917 aged 23. He was the s on of Herbert Searle Whitmore and Annette Whitmore (née Watkins, daughter of William Watkins of Groombridge Kent) of The Red House, Tenchley’s Park, Limpsfield. He was born on the 25th of May 1894 and was educated at Hazelwood School Limpsfield and at Marlborough. He joined the King’s Shropshire Light Infantry in 1912 and was gazetted 2nd Lieutenant the same year. At the outbreak of was he was with the 3rd (Reserve) Battalion at Shrewsbury and left for France from Pembroke Dock Chatham joining the 1st Battalion on the 3rd of December 1914. He was admitted to the 18th Field Ambulance on the 31st of January 1915 (reasons not known). On the 8th of August 1915 he was given temporary command of “A” Company and was wounded with them in an attack on Hooge Crater the following day (A&B Companies made the assault).He was invalided home. He rejoined the Battalion on the 16th of May 1916 and was posted to “D” Company. He was given temporary command of “D” Company on the 13th of July 1916. From the 19th to the 24th of July 1916 he reported sick and spent time at the Field Ambulance again. He was promoted to Captain in the field and put in command of “D” Company on the 28th of October 1916 and was sent home on leave for the period 14th of November to the 25th of November 1916. On the 15th of February 1917 Germans of the 165th Infantry Regiment tried to raid “D” Company in the Hohenzollern sector of the Loos front. The attack did not make the British lines. A patrol was sent out later which recovered one of the German dead. From the 22nd of February 1917 to the 4th of March 1917 he was back at the Field Hospital returning there again four days later. He rejoined from the base on the 4th of May and resumed command of “D” Company. For the period 22nd of June to the 29th 1917 he was sent on a Lewis Gun course at Le Touquet. On the 7th of July 1917 the Germans launched another major raid on “D” Company’s positions starting with a fifteen minute intense bombardment of their positions. The company suffered heavy casualties and six of them were awarded medals for gallantry, among them Captain Whitmore. He was killed at the head of “D” company in an attack on a spur near Ribecourt on the 20th of November and is buried at Ribecourt British Cemetery Row B Grave 12. 3rd Battalion New Zealand Rifle Brigade. Killed in action 12th of October 1917 aged 35. Alfred Winter-Evans was born in Natal, South Africa in 1881 the elder son of Colonel Robert Winter Evans and Mrs Evans of Kingsdowne, Durban, Natal. He was educated firstly at Durban High School, then moved to England where he attended St George's School, Harpenden until 1898. On leaving school he returned to South Africa in 1898 where he worked as an underground sampler for the Crown Deep Gold Mining Company of Johannesburg and for six months during 1899 he worked as shift boss for Crown Deep Limited. Following the outbreak of the South African War he enlisted as Trooper 292 in the 2nd Battalion Natal Mounted Rifles on the 29th of September 1899. On the 4th of November 1899 he was in action between Limit Hill and Helpmaaker near Ladysmith during which he was recommended for the Victoria Cross but was instead awarded the Distinguished Conduct Medal. He was also awarded the Queen's Medal with five clasps and left the army on the 31st of May 1902. After the war he moved to New York where he attended the Columbia School of Mines at Columbia University, graduating with an EM degree in 1906. During 1906 he was engaged as an assayer to a mining company at Poland, Arizona. In 1907 he returned to South Africa once again where he worked as an underground contractor in a number of mines including the French-Rand, Village Main Reef and City Deep. In 1908 he went to work for Ferrerra Gold Mining Company at Johannesburg where he worked as shift boss and in 1909 he moved to New Zealand. (née Foster) of Limpsfield and they had two children. From 1909 to 1915 he was General Manager of Consolidated Gold Fields of New Zealand Ltd. at Reefton, the second largest goldfield in the country. In 1912 he led the company during a bitterly fought strike which lasted 6 months, the collapse of which enabled him to introduce reforms to the industry which increased production substantially. His reforms are credited with ensuring the survival of the Reefton fields through the depression of the 1930s. On the outbreak of war he rejoined the army and was a member of the New Zealand Motor Service Corps before transferring to the New Zealand Rifle Brigade. He embarked for overseas service at Wellington on the 5th of February 1916 as commanding officer of C Company, 4th Battalion. In May 1916 he went to France where he was mentioned in Sir Douglas Haig’s despatches of the 9th of April 1917 and those of the 7th of November 1917. On the 29th of November 1916 he was promoted to Lieutenant Colonel and given command of the 3rd Battalion. A British attack on Bellevue Spur and part of the main Passchendaele Ridge on the 9th of October 1917 had gained a little ground at great loss. Heavy belts of barbed wire still protested the well entrenched enemy and barrages by the heavy artillery made no impression on them, or on the pillboxes beyond. The 2nd and 3rd Brigades – the latter weary from heavy work in the salient – were ordered to renew the attack early on the 12th. The men waited overnight for the attack the following morning in a sea of mud and under a steady rain. While still in their assembly area they came under shell fire from own guns when the thin barrage opened at 5.25 am At the same time they began their advance under deluge of small-arms fire interspersed with artillery fire. As they neared the enemy line they encountered thick belts of barbed wire. Some men tried to crawl under it, some threw themselves at it and two men got right through and were killed in the act of hurling grenades at the loopholes of the nearest pillbox. The battalion gained some 500 yards of ground on the left of the attack, but only 200 yards in the centre of the attack. On the right they gained nothing until the occupants of two enemy blockhouses and a nearby trench ran out of ammunition, whereupon around eighty prisoners were taken. He is commemorated on the Tyne Cot Memorial NZ Apse Panel 7. 189th Siege Battery, Royal Garrison Artillery. Died of wounds on the 15th of November 1917 aged 29. George Ernest Wood was born at Limpsfield. He was married to Charlotte Wood of Champion Cottages, Limpsfield Chart. He was educated at the National School, Limpsfield after which he worked as an assistant grocer at the Supply Stores, Woldingham and he lived at 4 Winchester Terrace, Warlingham. He enlisted in the Royal Garrison Artillery at Croydon on the 8th of November 1915. He died at 4 Casualty Clearing Station from wounds of the head and armpit. Section II Row G Grave 23. 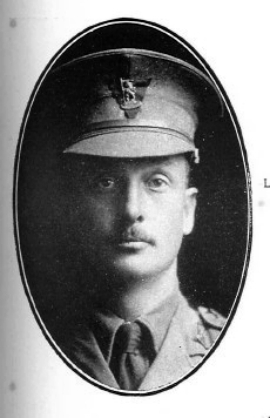 Woodroffe, Neville Leslie Lieutenant (above) Number 1 Company, 1st Battalion Irish Guards. Killed in action on the 6th of November 1914, aged 21. He was the son of Allen and Beatrice Woodroffe of 21 Cornwall Gardens London SW. Educated at Eton until 1911 where he was in Mr Brinton’s House and later at Trinity College, Cambridge. He joined the Irish Guards on probation in February 1913 as 2nd Lieutenant and was confirmed in his rank some months later being gazetted Lieutenant after his death to date from the 2nd of November 1914. He was mentioned in despatches by Sir John French on the 14th of January 1915. 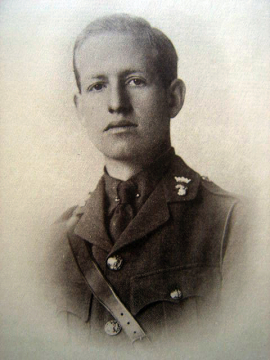 Lt. Woodroffe was shot and killed in the advance with reinforcements of the 1st Life Guards and some of his own men to retake a lost position at Klein-Zillebeke near Ypres. Two days earlier he was in command of No.1 Company when, not receiving the order to retire when attacked, they held their trench until dark and was “certainly instrumental in checking the advance of the enemy”. He is commemorated on the Menin Gate, Ypres Panel 11. 17th Battalion Duke of Cambridge’s Own (Middlesex) Regiment, A Company. He was born in Limpsfield in 1875 and later moved to Copthall Cottage in Westerham and attended Hosey School. He enlisted in Westerham joining the Royal West Kent Regiment as Private 8901 but was later transferred to the Middlesex Regiment. His battalion were detailed to capture the German positions at Oppy Village. They attacked at 4.30am and approached the village through the wood. They took the German front line trench on the western outskirts of the village but were later driven out and were forced back to their starting positions. Only 42 of the attackers answered roll call that night. Died of wounds on the 3rd of August 1916 aged 32. He was born in Limpsfield, enlisted in Hove and lived in Hurstpierpoint. He was the son of George and Rhoda Webb of North Cottage Limpsfield. On this day the battalion moved up and took over the front line at Waterlot Farm on the Somme. At 8.30pm and again at 9pm there were bursts of shell fire on their positions. At 10pm the Germans opened a heavy bombardment which continued until dawn the following day. When it finished 4 men were dead and 8 wounded. George Webb was one of the dead . He is buried at Corbie Communal Cemetery Extension, Plot 2 Row A Grave 33. 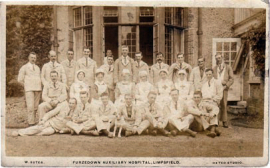 Local hospitals which tended the wounded. Follow the links for more information from Lost Hospitals of London. Furzedown was a convalescence hospital containing 22 beds for other ranks.